Send Me a Postcard From Station P, Will You? 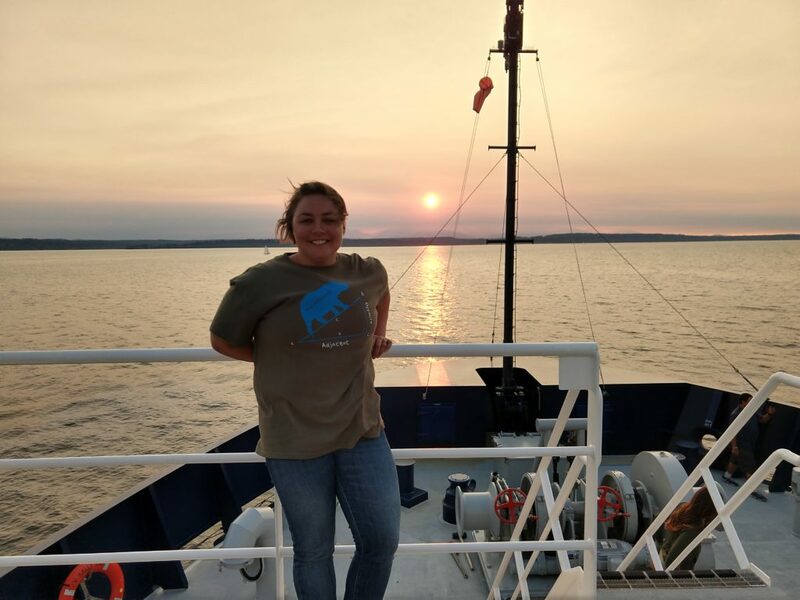 Adrian Marchetti is an associate professor in the department of Marine Sciences at the University of North Carolina at Chapel Hill and was aboard the R/V Roger Revelle for the EXPORTS field campaign this August and September. So perhaps you read about the EXPORTS cruise and have heard about this place called Station P. You are now probably wondering why NASA would fund a mission that includes two research vessels spending over three weeks at this place? Well, to some, Station P (also known as Ocean Station Papa or P26) is simply a point on a map in the middle of the North Pacific Ocean – latitude 50 degrees north, longitude 145 degrees west. But to others it is much more than that. Historically, in the 1950’s the Canadian weather service established a program to position ships off the west coast of Canada to forecast the incoming weather and sea state conditions. Station P was occupied for six weeks at a time by one of two alternating weather ships. Spending that much time at sea at one location can get, well, boring. 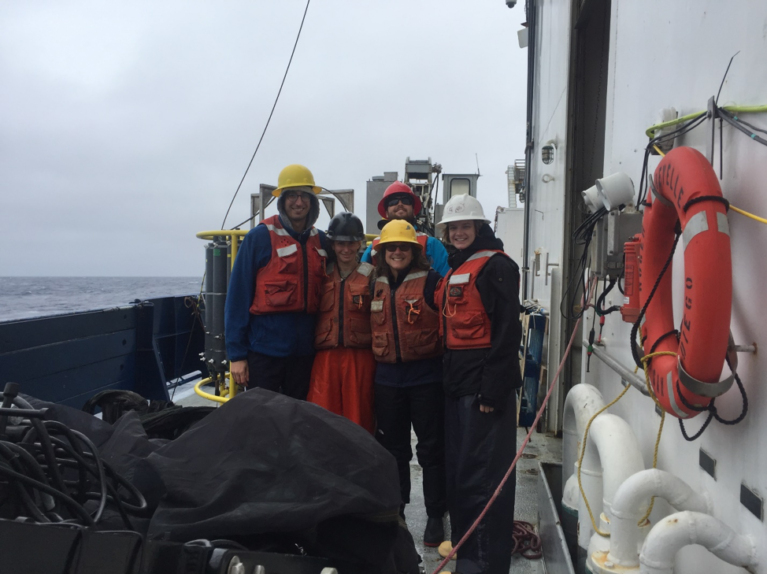 To help pass the time, the crew collected samples and obtained measurements of the ocean. In the early days, these included bathythermograph casts that measured ocean temperatures at various depths. As more sophisticated approaches were developed to measure additional ocean properties, they started collecting samples for analysis of seawater chemistry (salinity, nutrient concentrations, etc. ), chlorophyll concentrations (used as a proxy for phytoplankton biomass) and performed the occasional plankton haul to discover what critters called Station P their home. A few decades later, with the development of new satellite technologies that enabled the monitoring of weather conditions from space (thanks NASA! ), the weather ships became obsolete, and so the program was discontinued in the early 1980s. But as a result of the decades-long time series, what became apparent was the critical need for long-term monitoring of the ocean. So the Department of Fisheries and Oceans Canada established the Line P program made up of a transect where Station P is the endpoint. Today the Line P program is one of the longest ongoing oceanographic time series. Map of the Line P transect, ending at Station P (also known as Ocean Station Papa or P26) in the Northeast Pacific Ocean. Credits: Karina Giesbrect. So what’s so special about Station P? Well, this mostly depends on who you ask. For one, the North Pacific is one of the largest ocean basins. It undergoes periodic oscillations on approximately decadal timescales that can influence global climate. The North Pacific also represents the finish line of a long conveyer belt that transports deep waters from far-off regions of the planet to the surface. From a biologist’s perspective (yes, I am a biological oceanographer), Station P also happens to reside in a so-called High Nutrient, Low Chlorophyll (HNLC) region where the growth of phytoplankton is limited by the availability of the micronutrient iron. This is a relatively new discovery, and although evidence for iron limitation in this region dates back to the early 1980s, the most compelling data was obtained in 2002 when Canadian scientists performed a large-scale iron fertilization experiment at Station P. The experiment was named the Subarctic Ecosystem Response to Iron Enrichment Study, or SERIES. I participated in SERIES as a graduate student while completing my Ph.D at the University of British Columbia. My Ph.D. research focused on pennate diatoms (a type of phytoplankton) of the genus Pseudo-nitzschiathat that dominate iron-induced blooms in many HNLC regions across the globe . Microscope image of the pennate diatom Pseudo-nitzschia granii. Diatoms like this one are common responders to iron enrichment in many iron-limited regions of the ocean, including Station P. Credits: Adrian Marchetti. These particular diatoms can achieve rapid growth rates at iron concentrations that would leave their coastal counterparts fully anemic and left for dead. These oceanic diatoms have many adaptations to survive in low-iron waters and sometimes flourish when new inputs of iron, which are primarily from atmospheric dust, periodically enter the ocean. Prior to SERIES I joined a number of Line P cruises adding iron to diatoms in bottles to make them bloom. 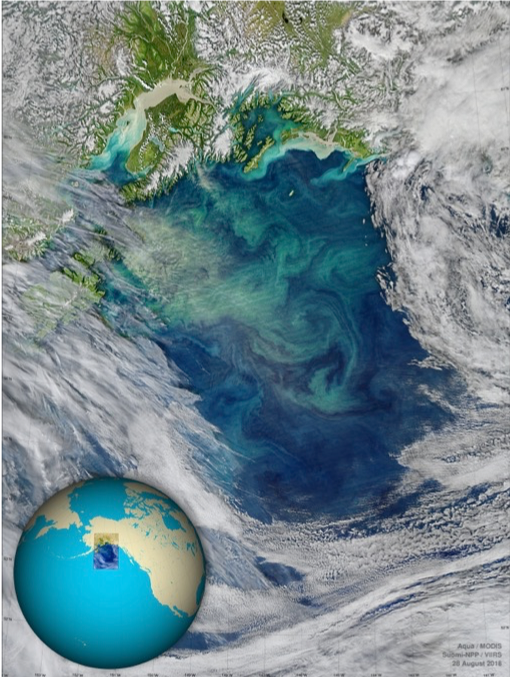 We now know that not all phytoplankton are created equal and, given their extensive diversity and important role in contributing to the planet’s carbon cycle, we need to keep studying them. During the SERIES experiment we also created a massive bloom of diatoms (you guessed it, dominated by Pseudo-nitzschia) as a consequence of adding several tons of iron to an initial patch of seawater approximately 80 square kilometers in size. At the peak of the bloom, the patch had grown to a size of about 700 square kilometers, representing one of the largest experimental manipulations on the planet to date. Fortuitously, the patch was captured by a satellite image of ocean sea surface color at the peak of the bloom, the only such image obtained throughout the entire SERIES experiment. 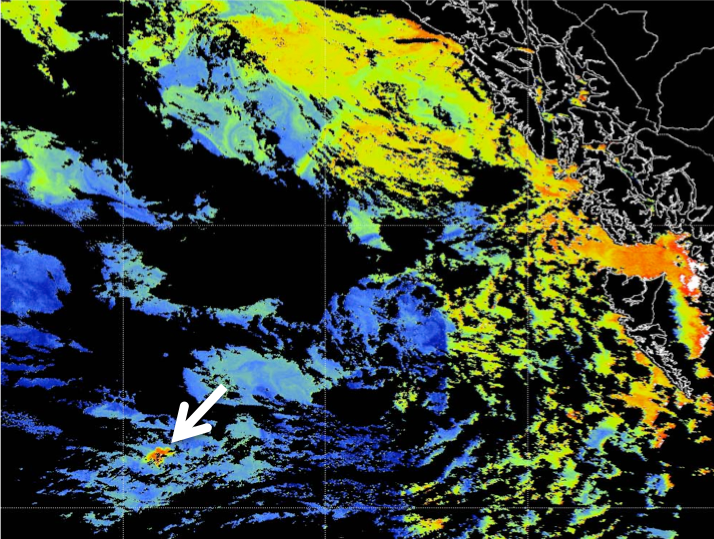 Indeed, the North Pacific Ocean is known for having dense cloud cover almost every day of the year. So this brings us back to EXPORTS, which marked my seventh trip to Station P, so I am beginning to feel quite at home there. With so many measurements obtained from Station P over the span of almost seven decades, what possibly is there left for us to learn? Well, to put it bluntly—lots! In my career I have been fortunate enough to participate on a number of field missions, and by far the EXPORTS program constitutes one of the most extensive scientific undertakings I have been part of. Although, this time we were not adding iron into the ocean but instead making observations of its natural state by following the same parcel of water that passed through Station P.
A primary objective of EXPORTS is to quantify the components of the ocean’s biological carbon pump, the process by which organic matter from the surface waters makes it’s way to ocean depths. 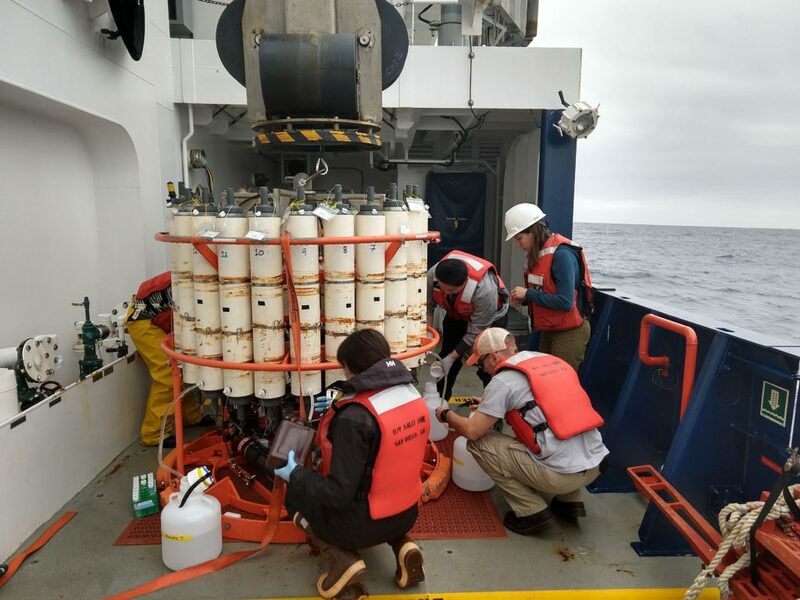 Scientists aboard both ships measured the processes that constitute the initial formation of organic matter by phytoplankton all the way to its export from the upper ocean or it’s remineralization back into inorganic carbon. 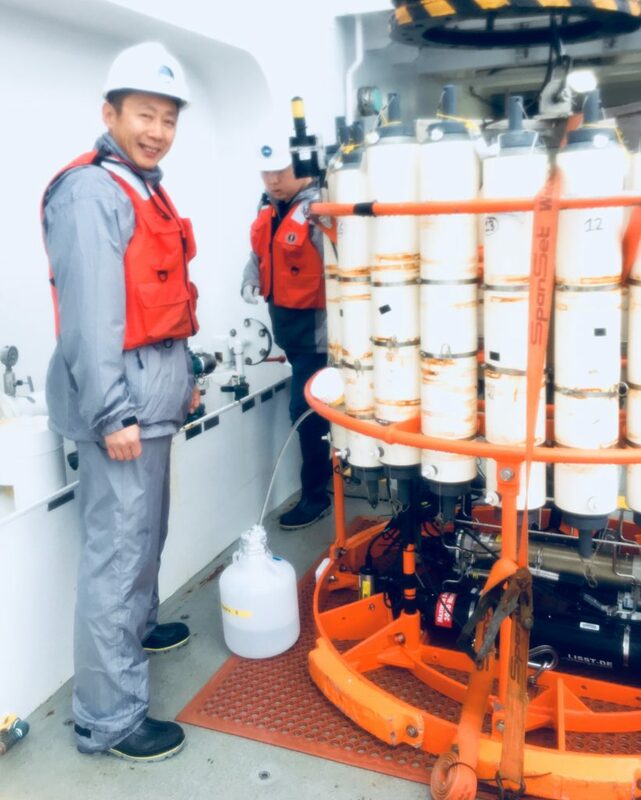 UNC graduate student Weida Gong hard at work collecting phytoplankton on filters aboard the R/V Revelle during the EXPORTS cruise. Credits: Adrian Marchetti. Bacteria or little animals known as zooplankton that feed on phytoplankton, bacteria, or other small animals perform both these processes. 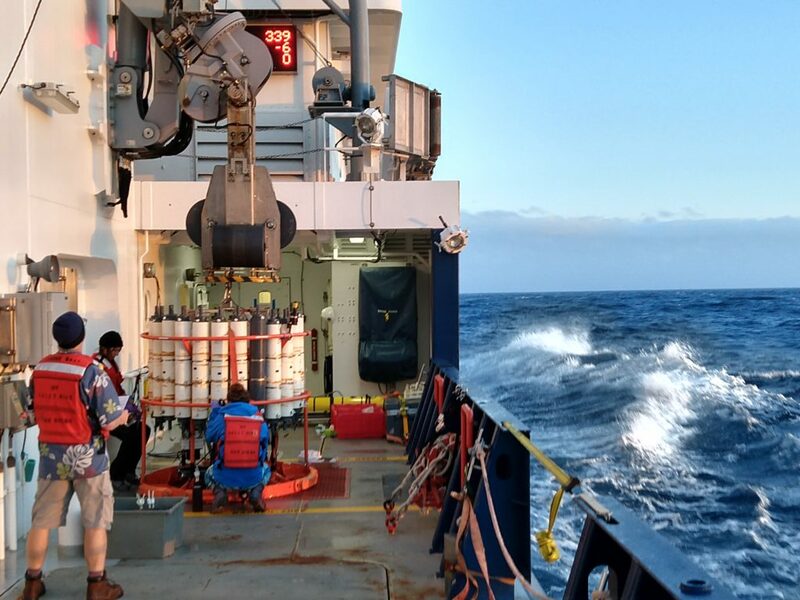 Other scientists were focused on measuring the fate of the carbon that does sink out of the upper ocean by looking at the overall amount and what forms these sinking particles take. It was quite an undertaking that had a lot of moving parts, all happening on two moving ships. There was also a large effort to obtain as much information about this region using a multitude of underway systems that includes mass spectrometers, particle imaging “cytobots” and flow cytometers, autonomous instruments that includes gliders, floats and wire walkers, and instruments that collect optical measurements. Although we may consider ourselves lucky if we are able to obtain more than a handful of satellite images of ocean properties from space, we are making similar measurements from ships. We are also making new measurements that do not currently exist on satellites but perhaps will one day so that we can continue to develop new ways of monitoring our precious planet from above. Through the years we have learned a lot about how this part of the ocean operates, yet there is still so much more for us to learn. This is especially important at this period in Earth’s history as we continue to place considerable pressures on our valuable ocean resources. And as for that postcard, well lets just say that it’s in the mail. For me, it has always been about the ocean. Don’t get me wrong, I love science. I know this because my time as a researcher has taken me to far more windowless labs in the basements of old science buildings than remote, dream-like field locations, and I have enjoyed every second of this work too! But even this windowless basement science ties back to Earth, the environment, and most importantly (in my eyes) the ocean. Throughout elementary and high school, I was drawn to science and math because they gave me new ways to look at the world around me. Suddenly, every baseball game was a math problem—the velocity of the pitch, the angle of impact, the parabolic motion of the ball as it headed into the outfield (why no… I’ve never been very good at sports, how did you guess?). As an avid outdoorswoman, science unlocked even more secrets. Physics and geology courses taught me about wave motion and erosion. Biology, ecology, genetics, and evolution classes allowed me to go to tide pooling and appreciate the radial symmetry of an ochre sea star while understanding its predatory role in the intertidal ecosystem. 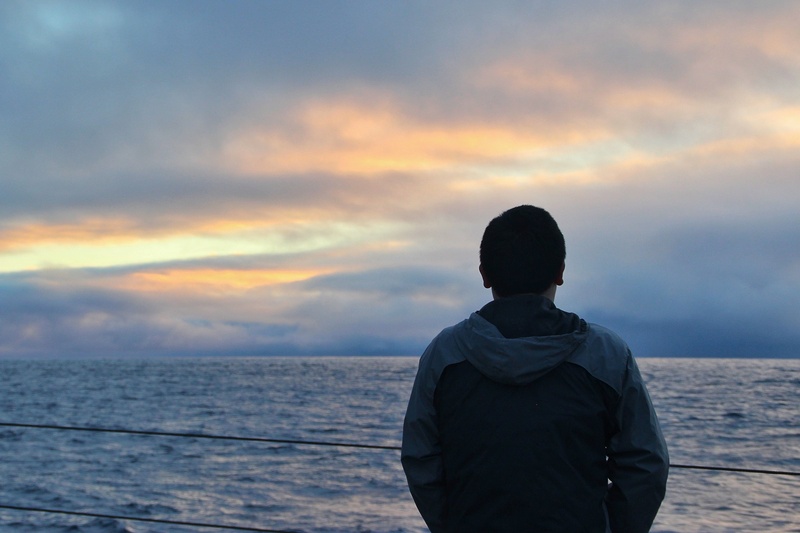 A firm grasp of chemistry allowed me to look at the ocean on a much smaller scale—a system of salinity gradients, dissolved nutrients, and pH balance. (Not to mention that chemistry makes cooking more interesting!) These subjects were interesting because I saw them every day around me, connected and continuously in flux, influencing each other in every way and giving me a new appreciation for all the activities and places I already loved. Now as a brand new graduate student in Earth and ocean science, I found myself living on a floating laboratory in the middle of the Pacific Ocean, with a view of the waves as far as the eye can see in a blue hue that is unlike anything I ever saw in my life. 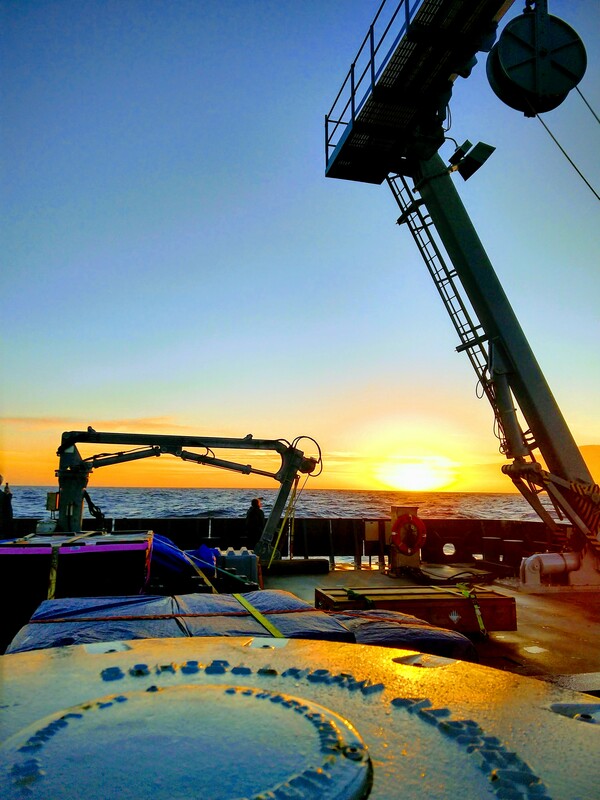 My group’s project aboard the ship was focused on quantifying how the plankton communities in the ocean influence carbon export by estimating the net community production at the ocean’s surface. 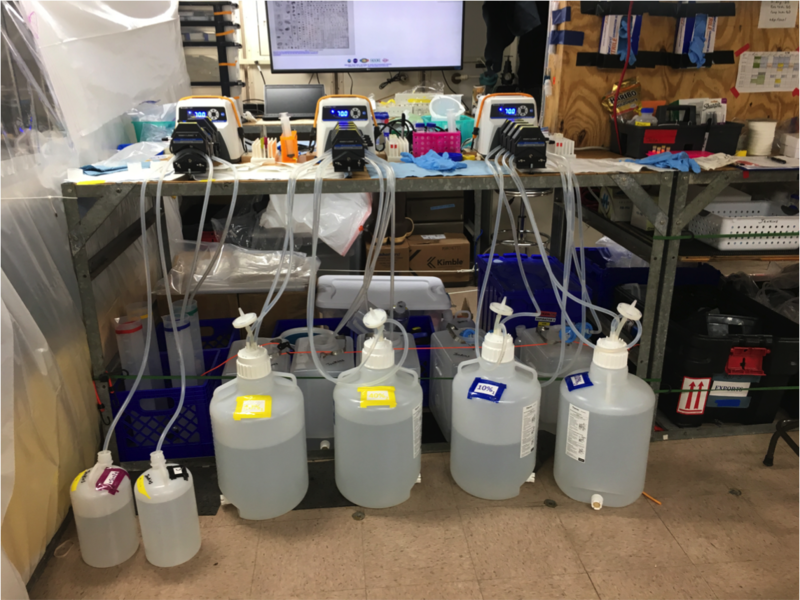 We did this by measuring biological oxygen concentrations in the surface water and pairing these data with genetic analyses of the microbial community. These measurements allowed us to infer how much carbon was being taken up by biological processes and thus, taken out of the atmosphere. 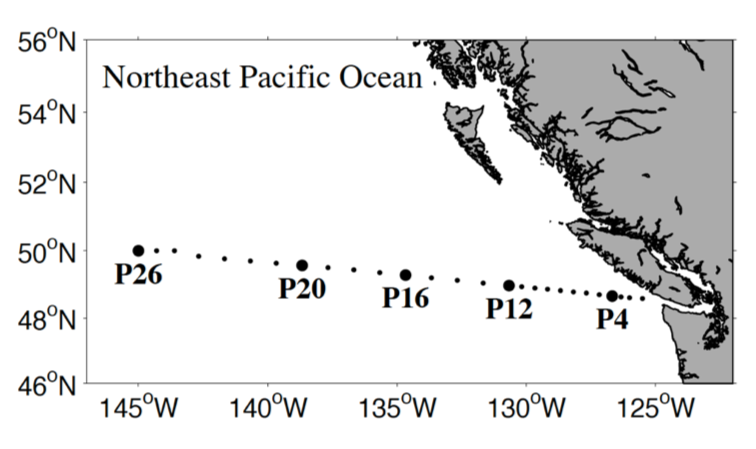 Diagnosing Diatoms: Do Anemic Diatoms Alter North Pacific Food Webs? The focus of our team is on a group of phytoplankton called diatoms, which are the floating, single-celled plants of the ocean. These organisms, through photosynthesis, use the energy from sunlight and the carbon dioxide we exhale and other sources to create food. Thus, they act as the base of a food web that sustains other animals in the ocean. Iron also plays an important role in the nutrition of these organisms. When iron is too low, diatom growth can be reduced and their photosynthesis less efficient, resulting in low diatom abundance and decreased energy transfer further up the marine food web. In the part of the Pacific Ocean sampled by the Export Processes in the Ocean from Remote Sensing, or EXPORTS, program, iron is at some of the lowest levels in the global ocean and not at levels that can support high diatom growth. 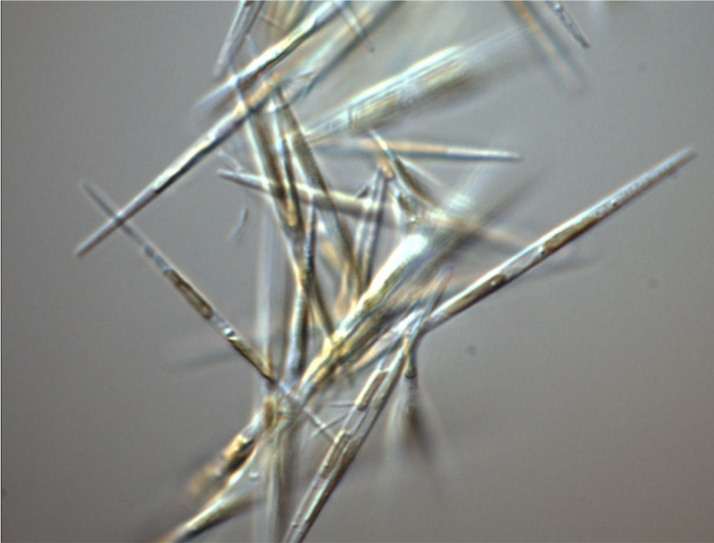 That being said, diatoms persist in this nutritionally challenged system, which drives the main goal of our EXPORTS experiments: to understand the impact that nutrients, such as iron, have on the role of diatoms in ocean carbon export. 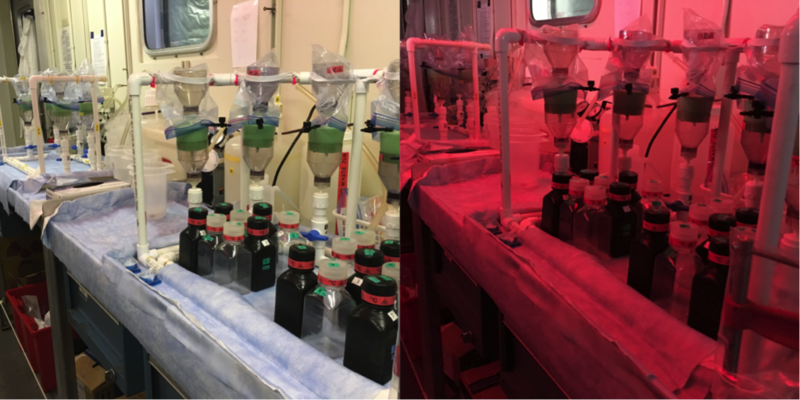 To help us better understand this nutrient/carbon export relationship, we are performing large incubation experiments and following rates of nutrient use using natural diatom communities that we fertilize with precise amounts of nutrients to simulate natural changes that can occur in the environment. 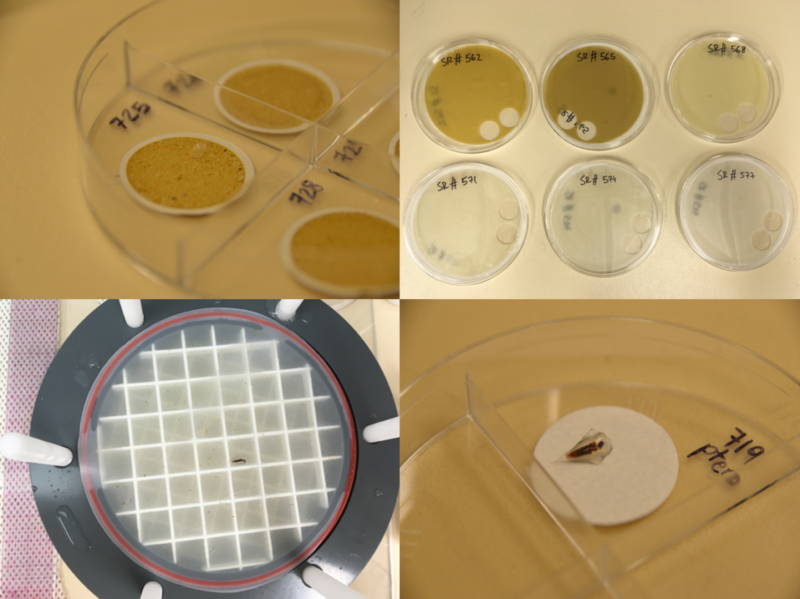 These experiments will improve our understanding of how these changes in nutrient availability affect diatom growth, diatom photosynthetic efficiency, and carbon production, as well as whether diatom species composition shifts or their gene expression alters in response to nutrient amendments. 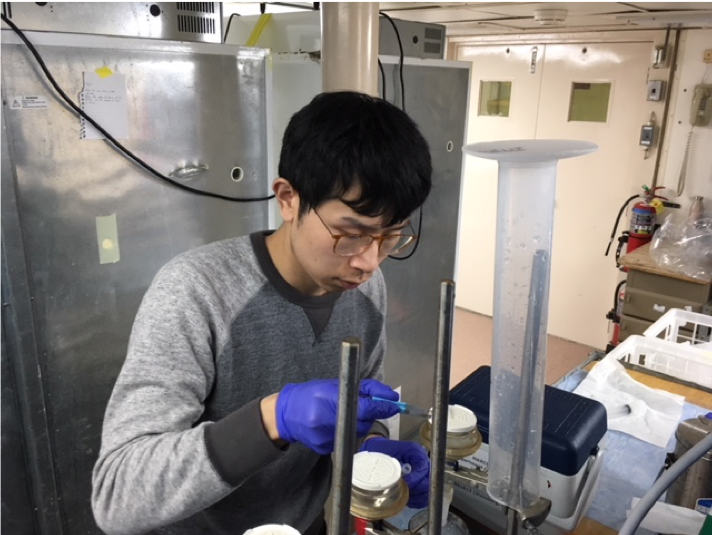 In addition, we are also using radioactive isotopes of carbon and silica to track changes in diatom nutrient uptake rates and their metabolic activity. 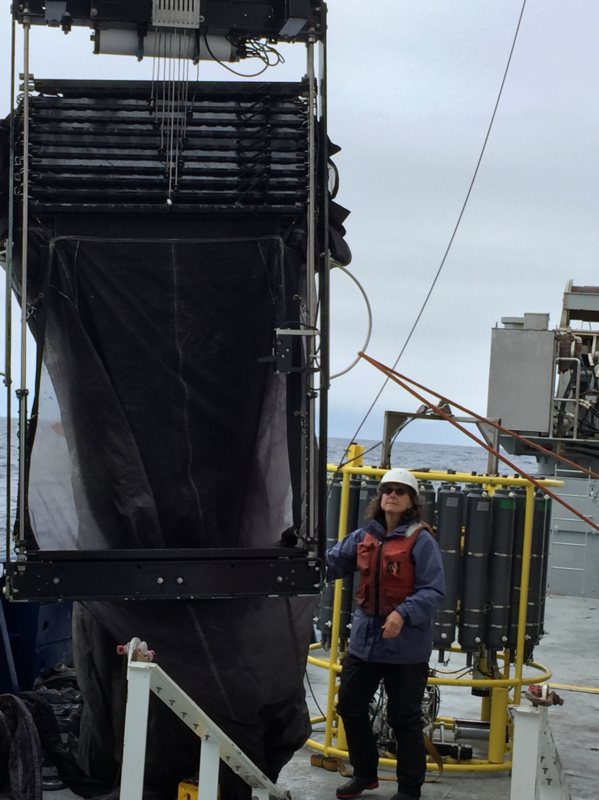 Working with the rest of the EXPORTS science team, we will evaluate how shifts in diatom nutrient physiology drive diatoms through different food web pathways that lead to the export of diatom carbon to the deep sea. In order to understand the growth rates and functions of diatoms in their natural environment, it is also important to study them in their natural conditions, which can be challenging when you are roaming the ocean in a large metal ship. 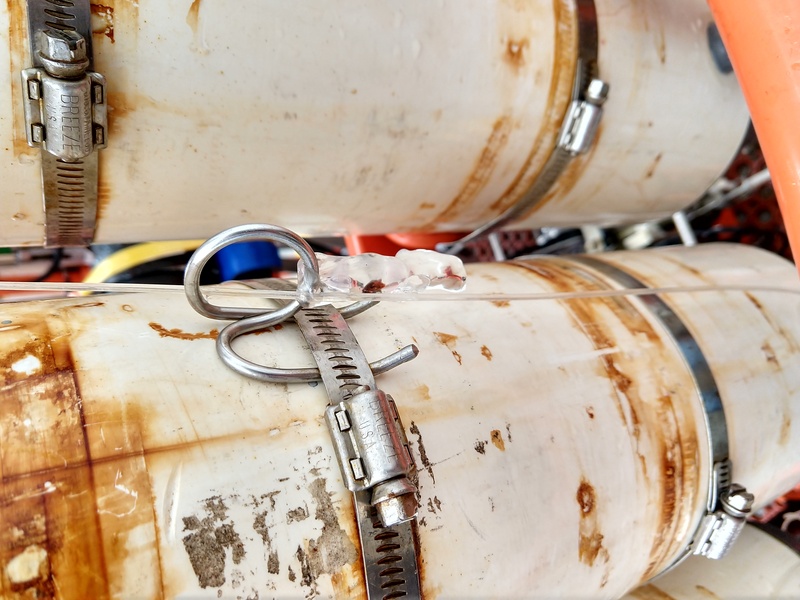 To ensure that our experiments are free from contamination, we take special measures to guarantee that we are collecting iron-clean samples, which is where our trace metal experts come into play. One: Trace metal clean rosette system. This is the bread and butter of collecting clean water samples from depth. We send the bottles down open, and close them at specific depths to bring that water back to the surface for measurements. These are standard sampling devices on all research ships, but ours is special in that we have swapped the nasty metal parts out for clean plastic parts, and the metal wire replaced with a stronger and metal-free Kevlar wire. 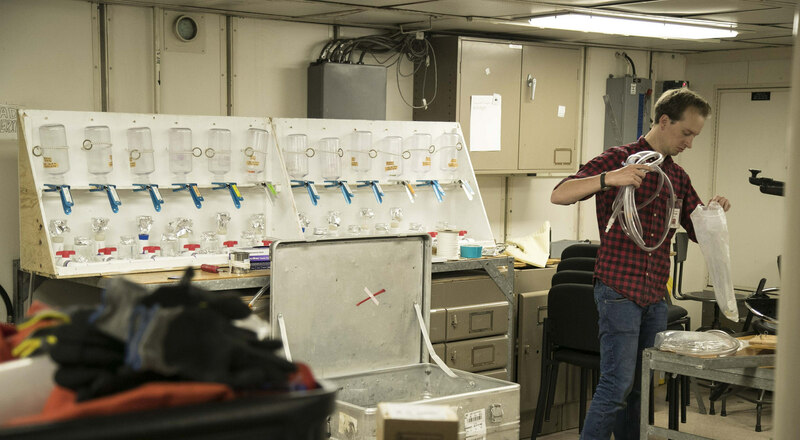 One of the biggest problems we have with keeping samples clean is dust, which is absolutely riddled with iron and is everywhere aboard the ship. To avoid this, we create spaces where we pump only the finest of filtered air in to fill our delicate lungs and keep dust out of our samples. On the ship we have two places dedicated to clean sampling. The first is out in the trace metal van at the back of the ship where our rosette bottles live and are sampled from hot off of a rosette cast. The second place we trace metal chemists feel comfortable enough to let loose and open our sample bottles is in our bubble in the main lab. 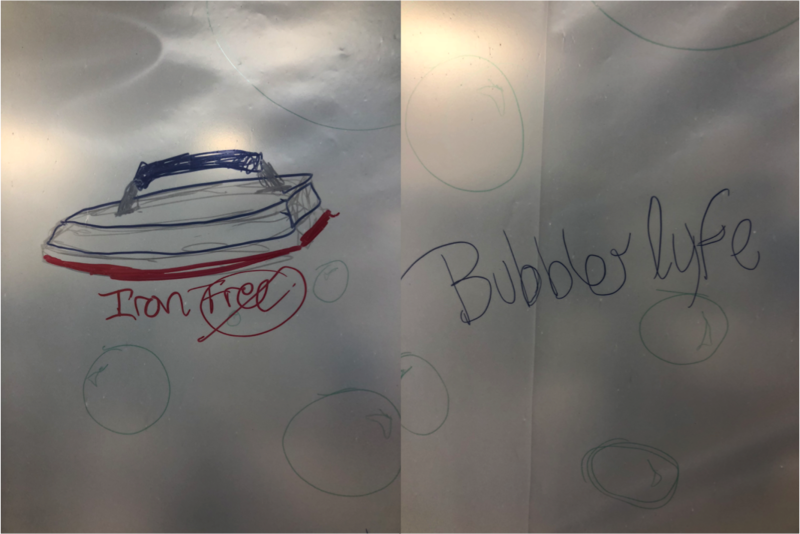 The space is our clean, plastic fort we have constructed (and decorated) and pumped with clean filtered air (to puff the bubble) so we can still work in the main lab while avoiding the mess of our dusty and rusty neighbors. The fish allows us to collect clean surface seawater by swimming out away from the dirty wake of the ship and sipping up that delicious iron-clean seawater through a plastic tube that we have hooked to a Teflon pump, bringing it right into our bubble. After collecting the diatom communities, we conduct a variety of experiments. After fertilizing them with nutrients, we need to allow them time to grow and adapt to their new conditions, while maintaining otherwise natural conditions. To accomplish this, we use large deck board incubators, which are continually filled with flowing sea water collected from the surface to keep them at natural temperatures. 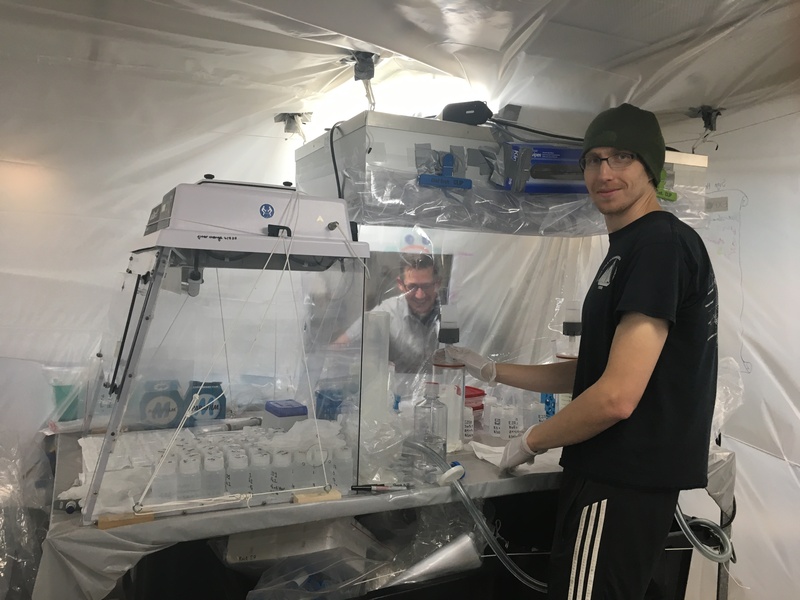 The incubators are also wrapped in dark screening to help simulate light levels found within the water column where we collected each sample. We monitor the response of the diatoms by measuring how fast they take up the nutrients under natural and fertilized conditions. In some experiments we use radioisotopes of silicon and carbon to do this, and we collect the samples in a special van dedicated to radioisotope use. In other experiments we look at how diatom physiology responds to fertilization by measuring what genes diatoms are turning on and off as they encounter different conditions. 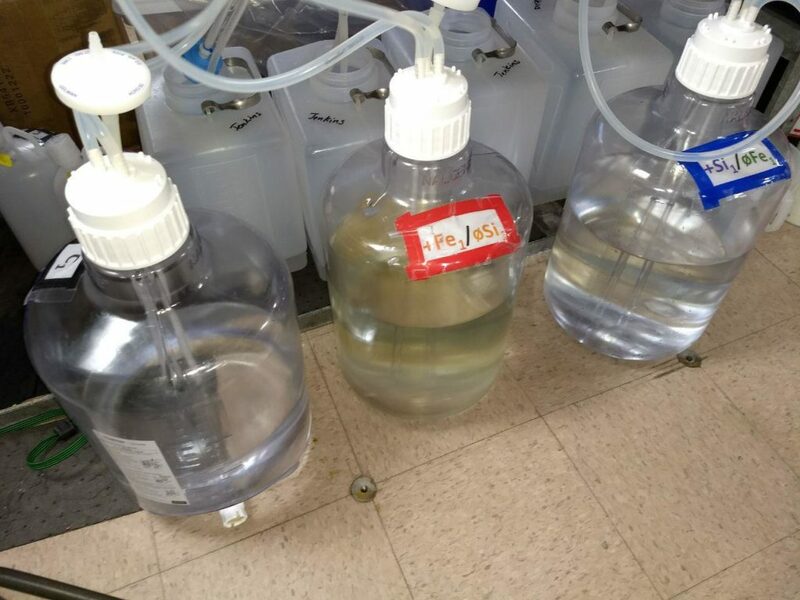 For these experiments, bottles that have been growing in the incubators are brought inside to the bubble to be harvested and ultimately filtered in the ship’s main lab. 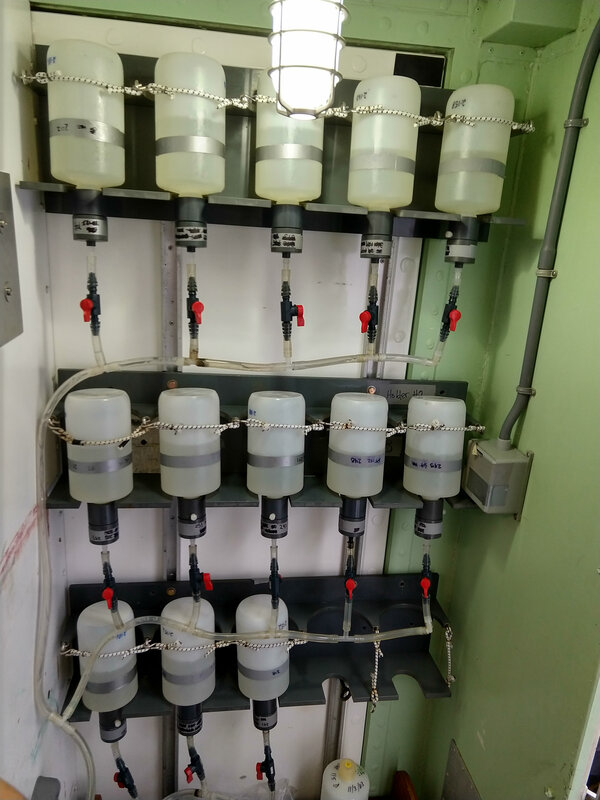 Water from the bottles is passed through a series of filters using peristaltic pumps to collect the larger diatoms as well as any other smaller organisms that are in the water. 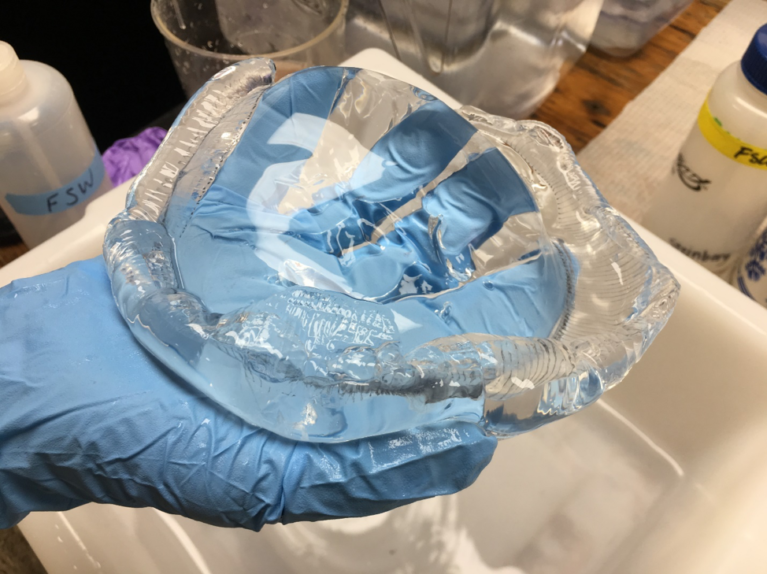 These filters are flash-frozen in liquid nitrogen, acting as a cellular snapshot, freezing the metabolic status of each cell in place for future analysis. 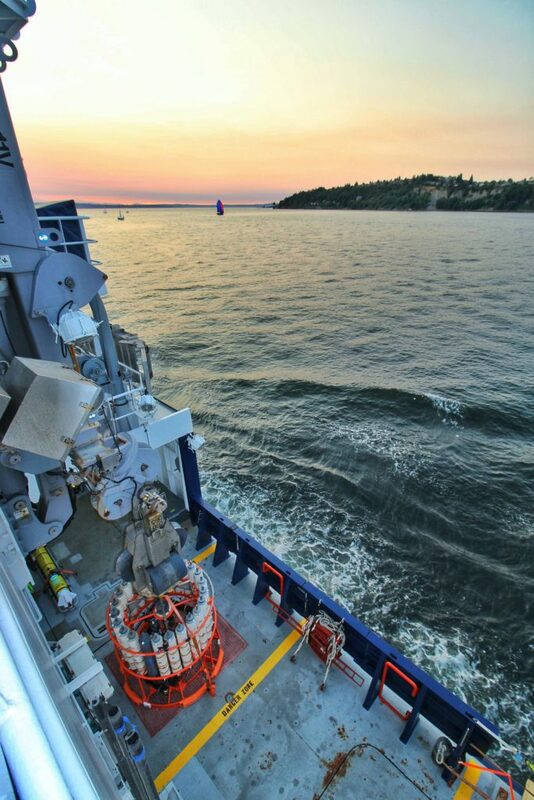 This combination of field and laboratory work, bridging chemistry and biology, will provide data that will improve our understanding of why diatoms follow specific pathways through the food web of the upper ocean, providing a predictive understanding of the processes that lead to carbon export by diatoms, which are one piece of the biological puzzle pumping carbon to the deep ocean twilight zone. I am Montserrat Roca Martí, but I like to be called Muntsa, which is a Catalan name. I come from Barcelona, Catalonia, where I finished my PhD one year ago. These last several weeks have been hectic and at the same time very exciting, as they included a wedding (my own, to be precise) and a big move from Barcelona to Falmouth, Massachusetts, where I am now a Postdoctoral Investigator at the Woods Hole Oceanographic Institution (WHOI). However, I didn’t spend much time in my new office. Instead, I spent most of my time getting equipment ready and packing over one hundred items of all shapes and sizes before leaving for Seattle in August. All this activity is devoted to the Export Processes in the Ocean from Remote Sensing (EXPORTS) expedition in the Northeast Pacific. 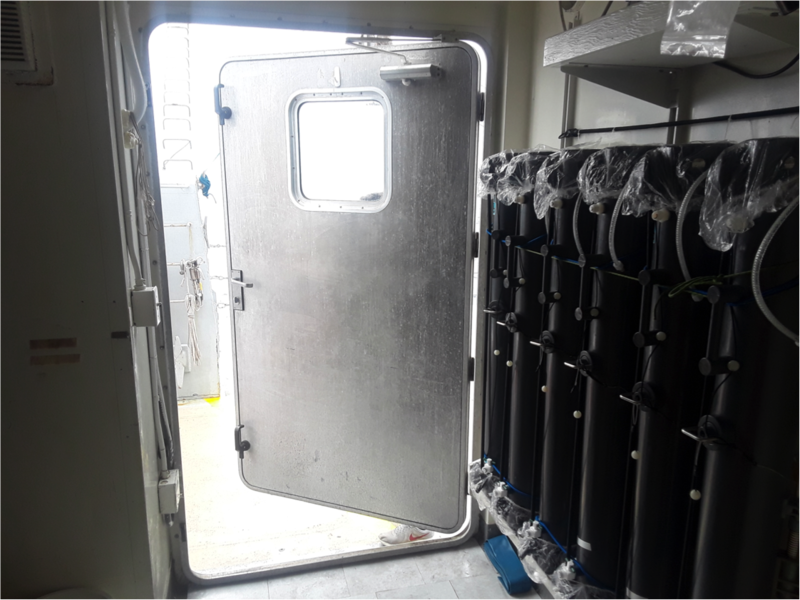 The primary goal of this project is to understand how carbon is converted from inorganic matter (carbon dioxide) to organic matter by phytoplankton. This forest of tiny photosynthetic organisms, mostly algae, represent the primary way the ocean is able to sequester carbon from the atmosphere, regulating Earth’s climate. 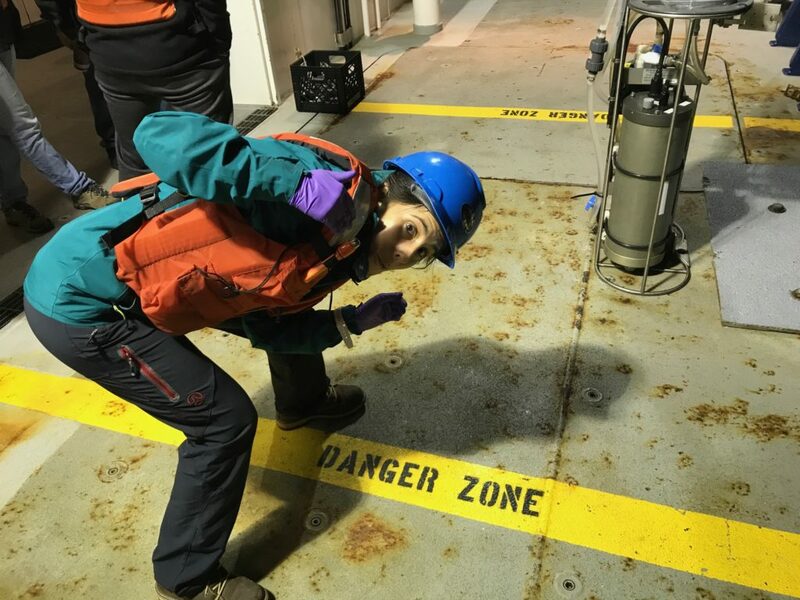 So here I am at 50ºN 145ºW aboard the R/V Sally Ride. I never would have imagined that I’d be spending my honeymoon in open ocean waters with 40 people, none of whom are my husband! I belong to Café Thorium, a team comprised of amazing people who love espresso and also studying thorium in the ocean. We are interested in thorium—a radioactive, metallic chemical element—because it provides very valuable information about the transport of other elements, such as carbon, from the ocean surface to depth as particles sink. My main role in this expedition is to collect particles from different depths down to 500 meters in order to determine their composition and concentration in water. To do that, we use in-situ pumps, which are like underwater vacuum cleaners equipped with filter heads that we lower into the ocean to specific depths and turn them on. These heads contain filters of different pore sizes through which thousands of liters of seawater pass during four to five hours of intense pumping. This operation requires strong and skillful people to lift nine heavy pumps and attach them to the wire that will transport them to the desired depths. Fortunately, two of our team, Spike and Claudia, are very experienced and have done this complex endeavor hundreds of times. When pumps are back on deck, we have to remove the filters as quickly as possible before the organic particles degrade. This is Rock & Roll time for Blaire and me. We sub-sample as many as 50 filters so we and others can measure a variety of parameters, including microbial activity, pigments and carbon. 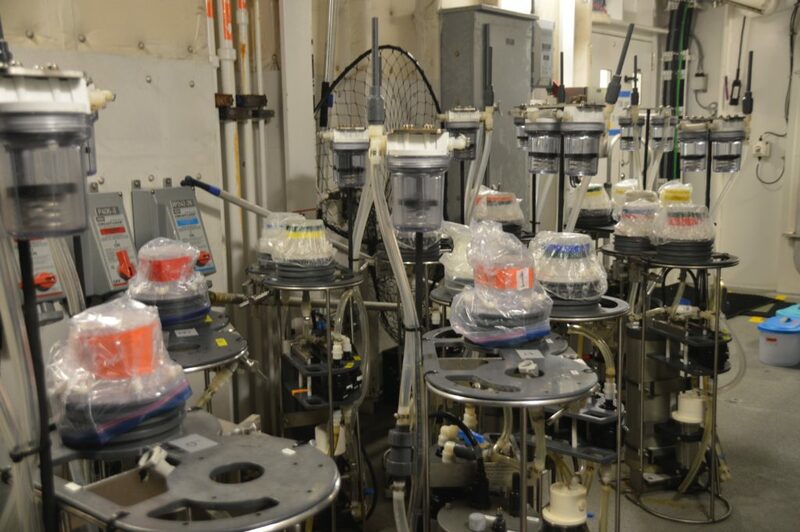 Only then can we safely store our precious samples until further analyses back at WHOI and a few other institutions. So far, we have collected over 500 samples from more than 77 cubic meters of water (more than 20,000 gallons) and counting! This is how I am spending my honeymoon! Meg Estapa is an assistant professor at Skidmore College and leads the EXPORTS sediment trap team. 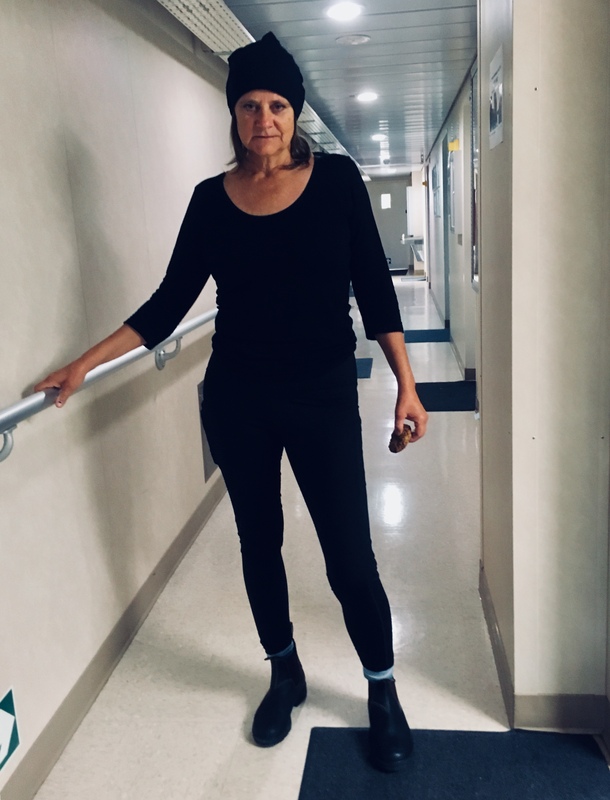 Her current work focuses on the optical properties of sinking particles and how these can serve as proxy measurements to help us better characterize the spatial and temporal scales of the biological pump. 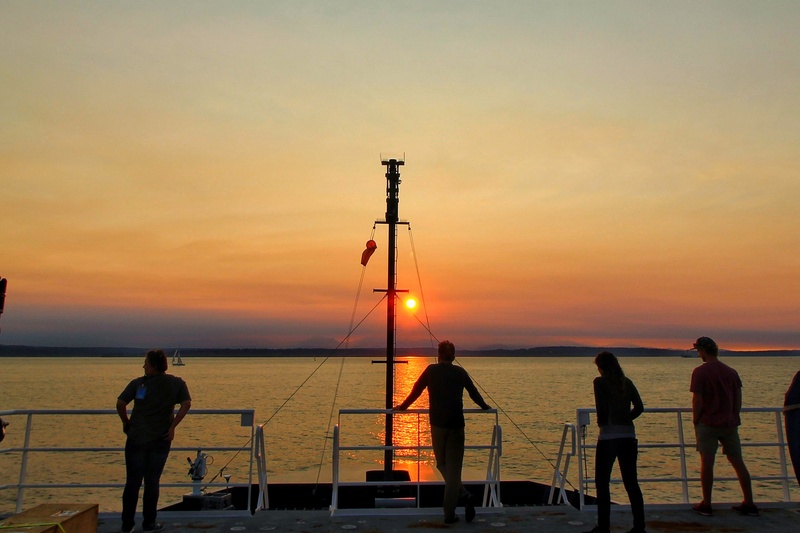 She is currently working aboard the R/V Roger Revelle. One of the unusual things about the EXPORTS field campaign is the number of independently drifting instruments that we are using. These instruments include profiling floats, gliders, self-ballasted and moored sediment traps, and wave-powered profilers. 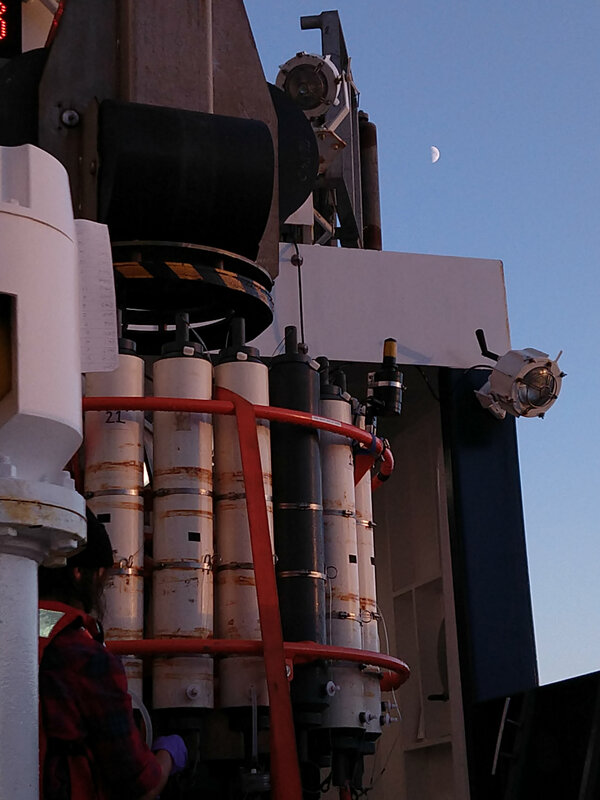 Untethered from the ships, they multiply the observations we can make directly from the R/Vs Revelle and Ride. 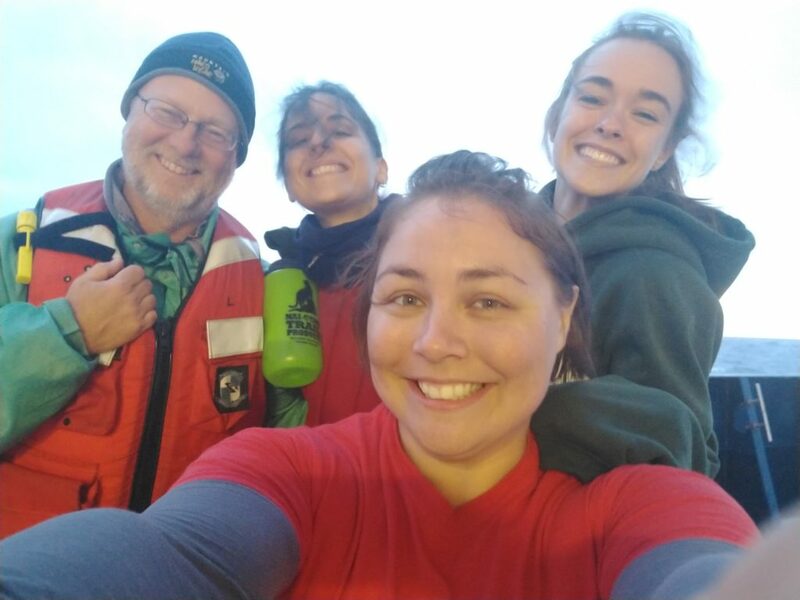 My team on the Revelle is responsible for all of the sediment traps and the wave-powered profiler (also known as the WireWalker). Right now we have seven different sampling devices to keep track of that are drifting out there in the ocean! 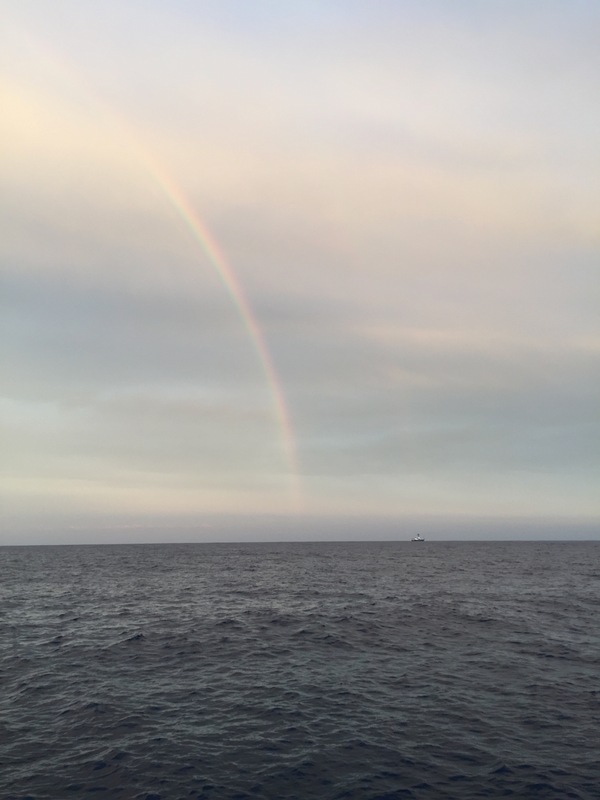 Needless to say, in addition to our science, much of our mental energy at sea is taken up by one very important operational task: finding our equipment in the ocean. Our sediment traps consist of cylindrical, rain gauge-like devices that capture sinking particles as they drift slowly downward over periods of days. They are attached either to a profiling float that carries them down to drift at depth (a neutrally buoyant sediment trap or NBST) or to an array of trap frames that dangle like a string of beads from a floating buoy at the surface (a surface-tethered trap or STT). 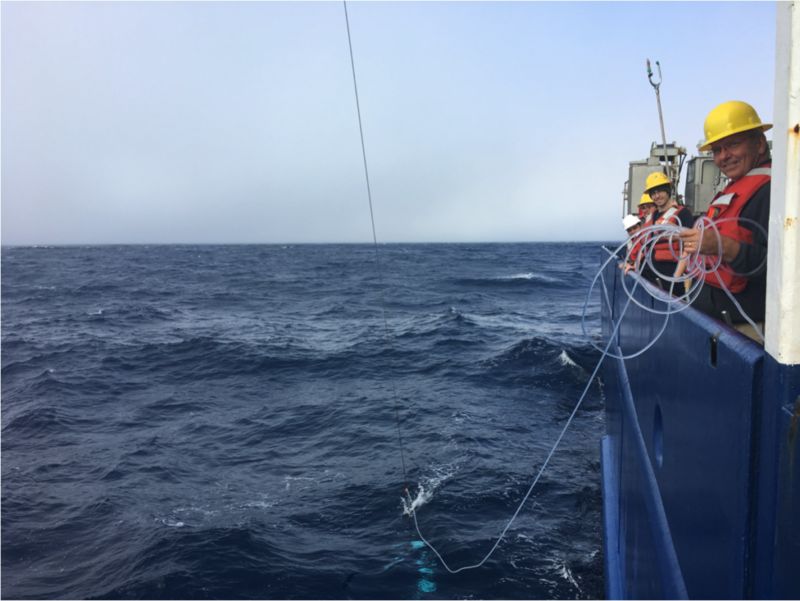 None of the traps are connected physically to the R/V Revelle—we release them to drift on their own and then come back to retrieve them three to five days later. The ocean flows at speeds of a few kilometers per day, so the sediment traps won’t stay where we left them. Recovering sediment traps requires us to engage in a carefully choreographed dance that begins with the deceptively simple-sounding task of locating the positions of our equipment in the ocean. All together there are usually 14 robots and sediment traps in the water out here at Ocean Station Papa, each with its own pattern of dives and resurfacings. These assets are spread out over a box that is roughly 30 nautical miles on a side (that is, 56 kilometers on a side, giving an area of over 3,000 square kilometers!). Visually spotting one of those tiny objects floating on the ocean’s surface is like finding a needle in a haystack. To improve the odds of recovering our sediment traps, we rely on a collection of old and new technologies. The most important of these are GPS receivers that acquire precise location information, which is then transmitted via satellite back to computers on land. A second satellite connection allows us to access that location data over the Internet from the Revelle. 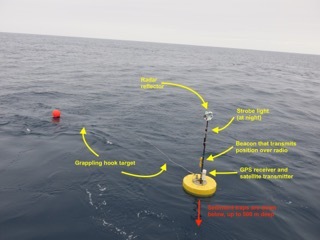 Some of our traps—the ones that have buoys at the surface—also send their GPS positions to the ship directly using radio transmitting beacons. All of our traps have bright, flashing strobe lights that are highly visible at night, and some even have two! Finally, the buoy marking our drifting trap array carries an oldie but goodie: a metal radar reflector that bounces radio waves back to the antenna on the Revelle to be seen as a bright “blip” on the bridge’s radar screen. When the time arrives to pick up a sediment trap, following the trail of GPS fix “breadcrumbs” is usually sufficient to bring the Revelle to within a mile or two of the recovery target. But a device drifting at the surface moves fast, and it takes a few minutes for GPS fixes to be relayed to us on the ship, so we’ll never find our target exactly at its last GPS fix. Especially for our smallest devices, the neutrally-buoyant sediment traps (NBST), the last and sometimes trickiest link is putting our eyes on the trap in the water. Only the top of the NBST pokes out of the water when it’s awaiting a pickup—about the size of a yellow-and-gray soccer ball, with 25 feet of floating yellow rope streaming out beside it. On a clear day it is just possible to spot an NBST from a mile away, and at night their flashing strobe lights are visible from a distance of perhaps two miles. But the cloudy, misty weather out here is less than ideal. On a typical trap recovery night, a visitor to the bridge of the Revelle would find a line of scientists and crew arrayed along the forward windows in near pitch darkness, hoping to be the first to catch a glimpse of the blinking strobe out on the water. The first exclamation of “I see it!” always produces a bit of an adrenaline rush for me! 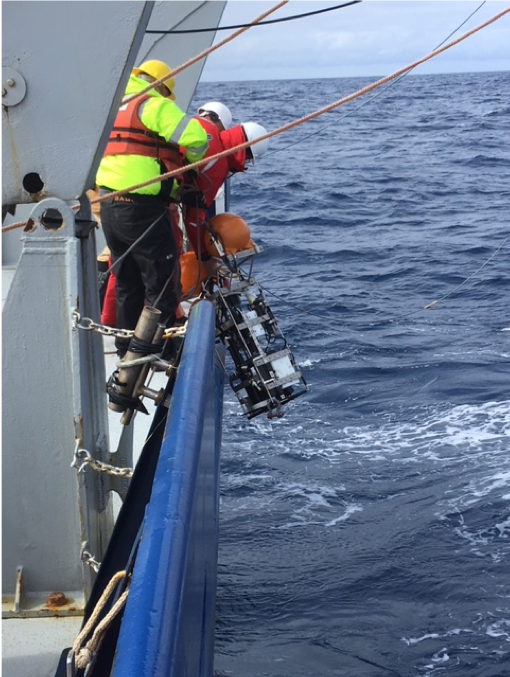 Following some expert ship handling to bring the Revelle right alongside the NBST, its precious cargo of samples and data is about to come back aboard. 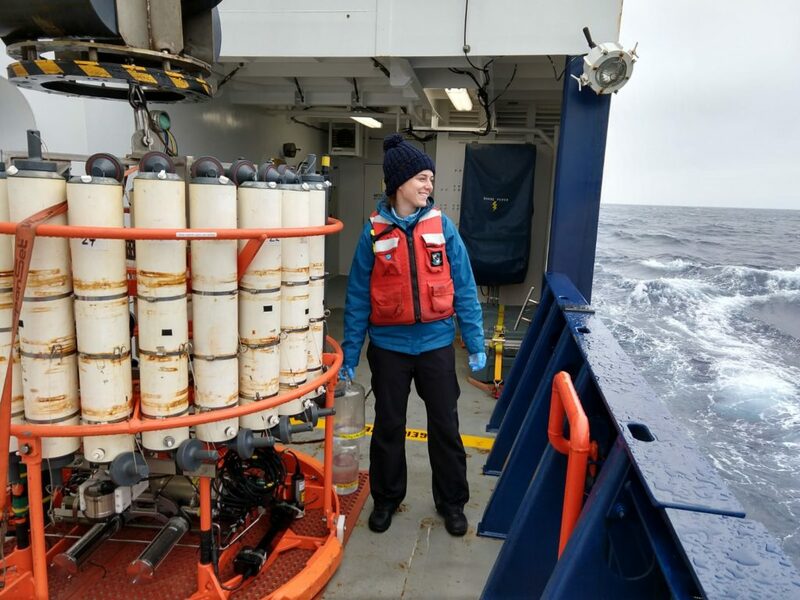 Chandler Countryman is a graduate student at the University of Georgia, studying the vertical transport of organic matter from the surface to the deep ocean. 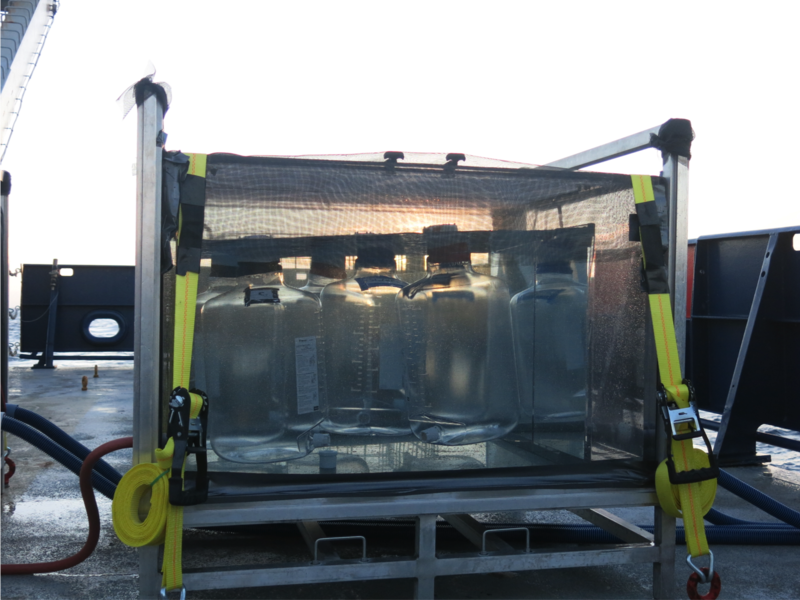 The Multiple Opening/Closing Net and Environmental Sensing System, or MOCNESS, is used to look at zooplankton, sea creatures ranging in size from microscopic to several inches. We’re interested in learning what types are present in the water column, how many there are, and at what depth they are found. As you go down in the water column the community of planktonic animals change, and the depth at which each type of zooplankton is found can change throughout the day, depending on the species. This is referred to as “diel vertical migration” and allows animals to swim to shallower depths during the night to feed and then retreat to deeper depths during the day in order to avoid being eaten by visual predators. The MOCNESS is a one-meter square frame with ten individual nets and each one can be opened at different desirable depths. 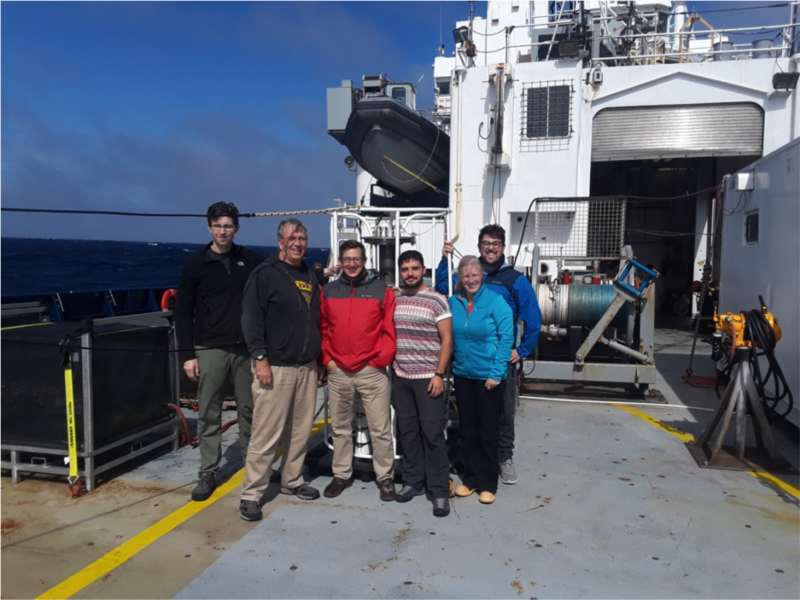 The zooplankton team aboard the R/V Roger Revelle, led by Dr. Debbie Steinberg of the College of William & Mary, has sent the MOCNESS down to 1000 meters ten times so far during the EXPORTS cruise, five times during the day and five times during the night. The day/night pairs allow us to look at this diel vertical migration behavior. 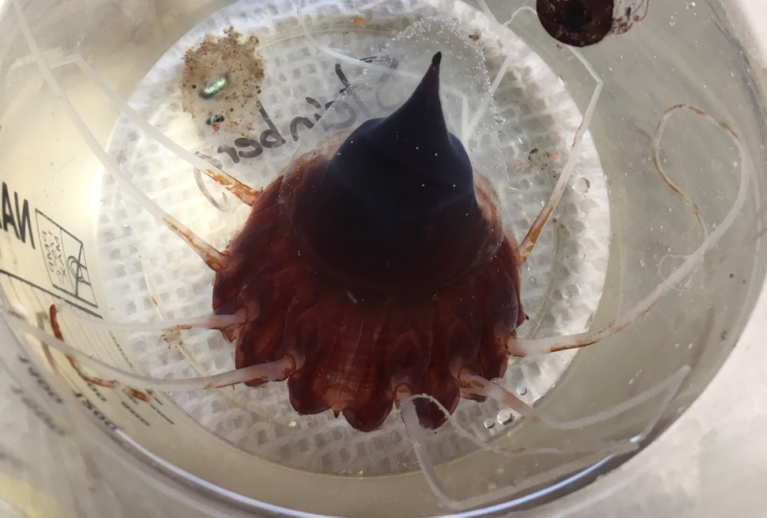 In addition to our beloved epipelagic (surface) and mesopelagic (intermediate depth) zooplankton species, we have also caught several neat, deep-sea animals. This beautiful fish was caught in our net that stays open from 0-1000 meters, so the exact depth in which it was caught is unknown. In general, this species of anglerfish can be found anywhere between 805 meters and 3475 meters deep. 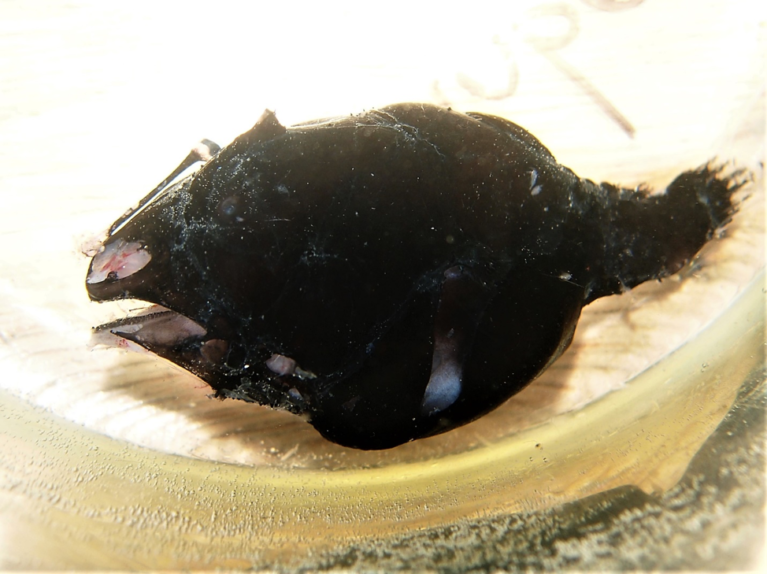 Most anglerfish are quite small and the maximum length recorded for this species is 10.2 cm (SL). It is dark-grey in color with a large head that has sharp teeth in its wide mouth. The most characteristic feature of this fish—and the reason for its name—is its lure (esca), which glows with the help of bioluminescent bacteria. The lure attracts small animals like crustaceans and fish and is only found on females. The males are much smaller than the females and start out as free-swimmers until encountering a female, at which point they dig their teeth into the female, and inject enzymes that break down skin, fusing themselves into the female. Once the male is fused with the female, its bloodstream is actually connected to hers, and then the males loses all organs except for his testes. This form of symbiosis is considered an adaptation to the low encounter rate experienced between individuals in the deep sea. The male gets nutrition from the female, and in return the female has available sperm for multiple spawning events. The female that we caught was still alive when she was brought on deck and we were able to film her swimming for a bit and to see the glow of her lure by going into a dark room—which in this case was the bathroom. This gnarly-looking predatory fish is a vertical migrator that lives between 200 and 5000 meters deep during the day and swims up to less than 200 meters at night to feed. 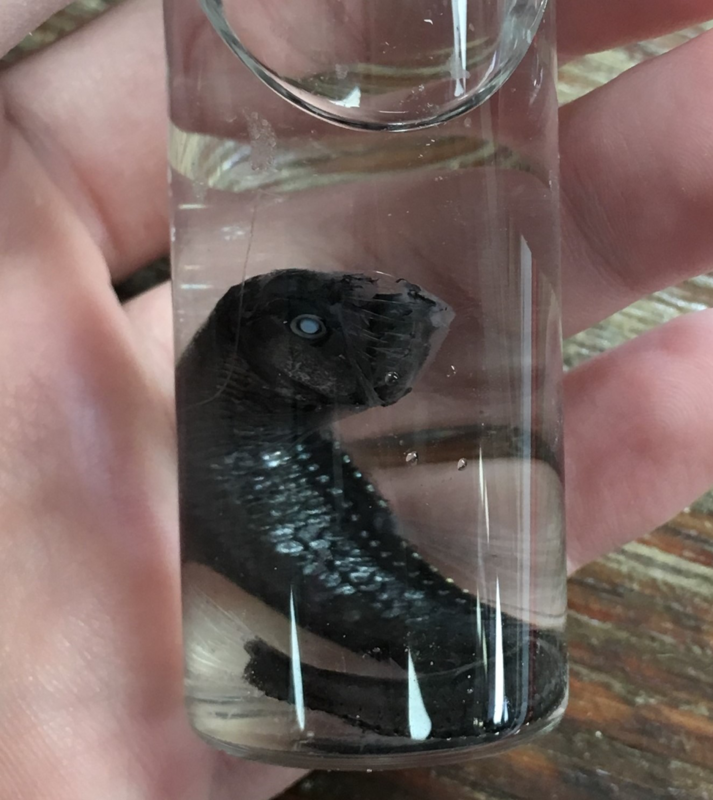 This species can reach a length of about 30 centimeters (1 foot) and is black/dark brown in color with photophores along its side, which are thought to be used as camouflage from predation below them in the water by making them blend in with the light from above. It is also possible that these photophores can attract prey or be used in mating. The most striking feature of the viperfish is its teeth, which are so large that they can’t fit inside its mouth and instead curve up towards the eye. Instead of being used for chewing, these teeth are used to impale its prey by swimming into it at fast speeds. The viperfish mostly eats crustaceans, arrow worms, and small fish. It has several adaptations to survive a low prey encounter rate in the deep ocean, including a hinged skull that allows it to swallow large prey, a large stomach that allows it to stock up on prey while it is abundant, and a low metabolic rate, which allows it to go several days without food. Myctophids are very common in the world’s oceans and can make up to 65 percent of the fish biomass in the deep sea. Most lanternfish are smaller than 15 centimeters (5.9 inches) and are diel vertical migrators that live between 300 and 1500 meters during the day and swim up to between 10 and 100 meters during the night to avoid predators and also to follow their food source, which consists mostly of vertically migrating zooplankton. These fish also possess photophores along their body, which can be used for camouflage just like the ones found on the viperfish. 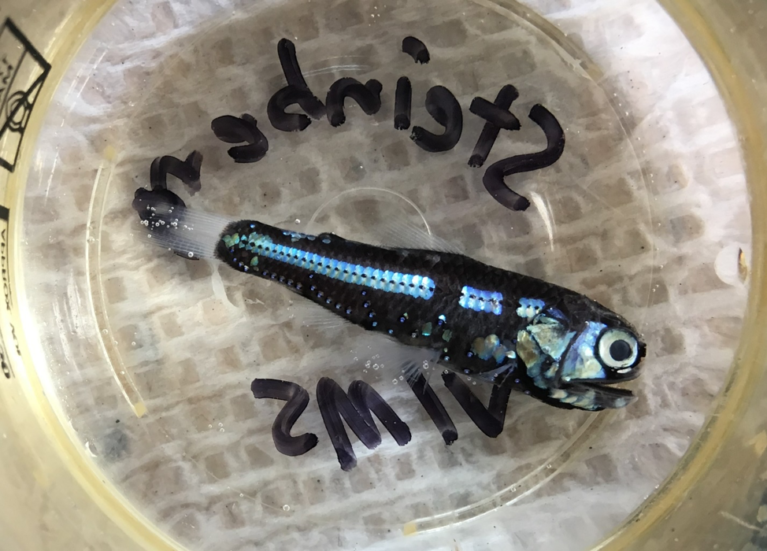 However, the photophores in lanternfish differ greatly between species, which indicates that it may also be used for communication and mating. 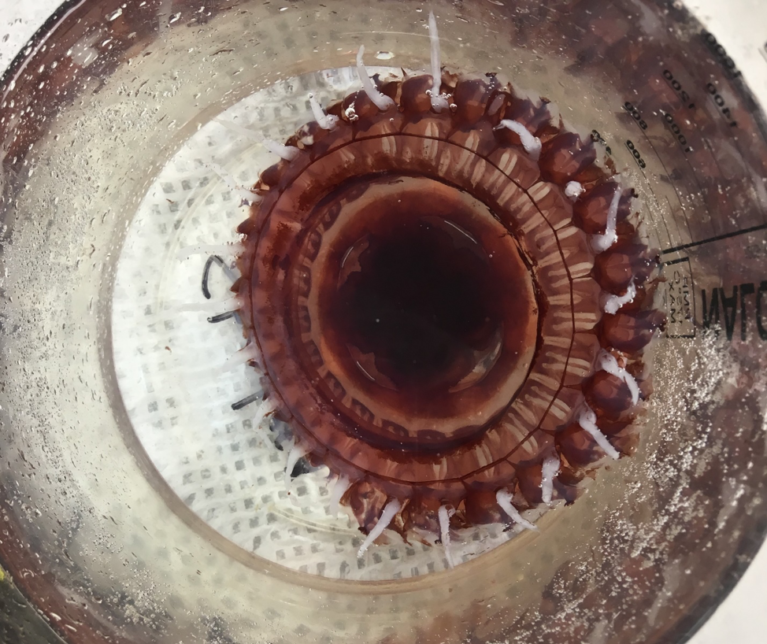 This deep-sea jelly is a vertical migrator that can be found between 500 and 1000 meters and avoids too much light because its red-brown pigment becomes lethal with light exposure. The umbrella can be up to 35 centimeters (~14 inches) in height and 25 centimeters (~10 inches) in diameter and is completely clear, showing the red/orange stomach inside of it. It has 12 orange tentacles that can be more than 50 centimeters (~20 inches) long, which have stinging cells on them to attack their prey. This jellyfish can actually use bioluminescence to produce flashes of bright light in order to protect itself from predation by confusing its predators. A helmet jelly’s body is 90 percent water. We have caught many more creatures including deep-sea shrimp, other jellies, squid, ctenophores and many more! 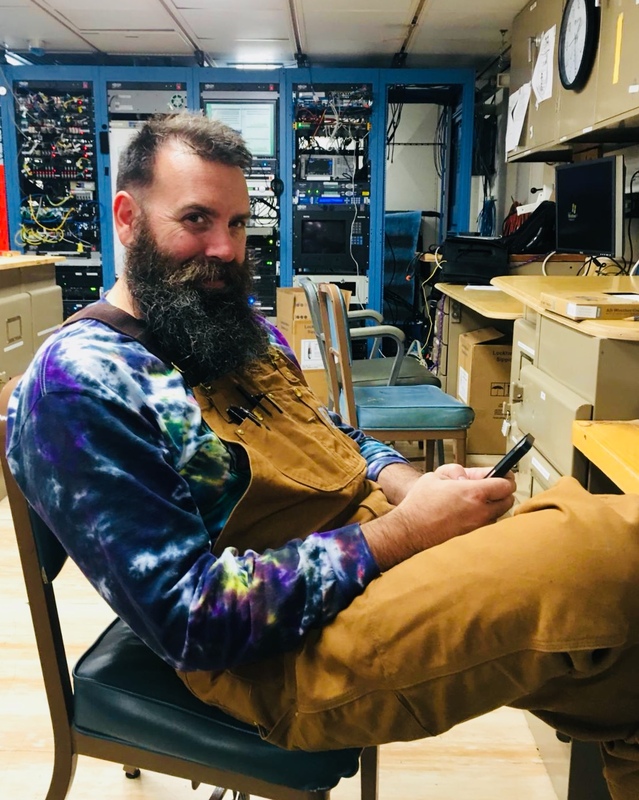 Brandon Stephens is a post-doc fellow working with Craig Carlson, a professor at the University of California Santa Barbara’s Marine Science Institute. 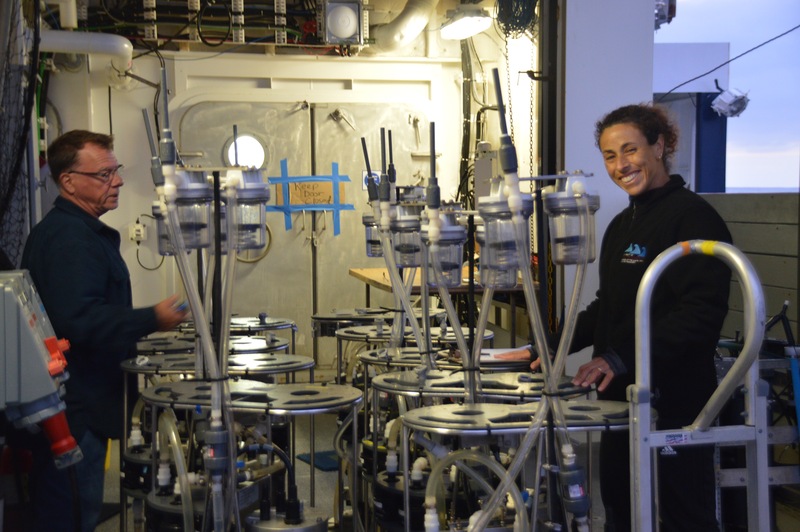 Their research focuses on the role marine microbes play in the cycling of elements through oceanic dissolved organic matter, which in turn plays a role in the fate of carbon produced in the ocean. 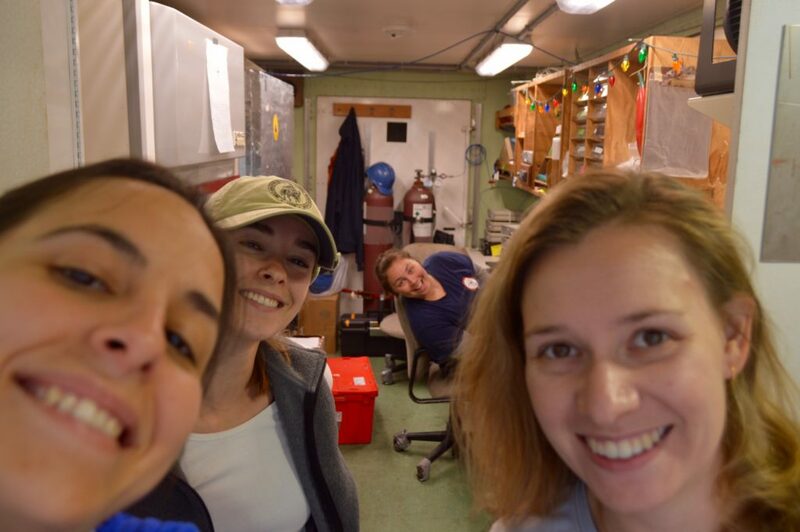 They are working aboard the R/V Roger Revelle for the EXPORTS field campaign. When one thinks of a NASA mission, thoughts of outer space, stars and other astronomic bodies come to mind. The image above could easily be mistaken for one of stars and planets or a nearby galaxy in deep space captured by the Hubble Space Telescope. But really, it’s microscopic life in the ocean. With the EXPORTS mission, NASA turns it focus, quite literally, from outer space to Earth’s inner space of the subarctic Pacific Ocean. 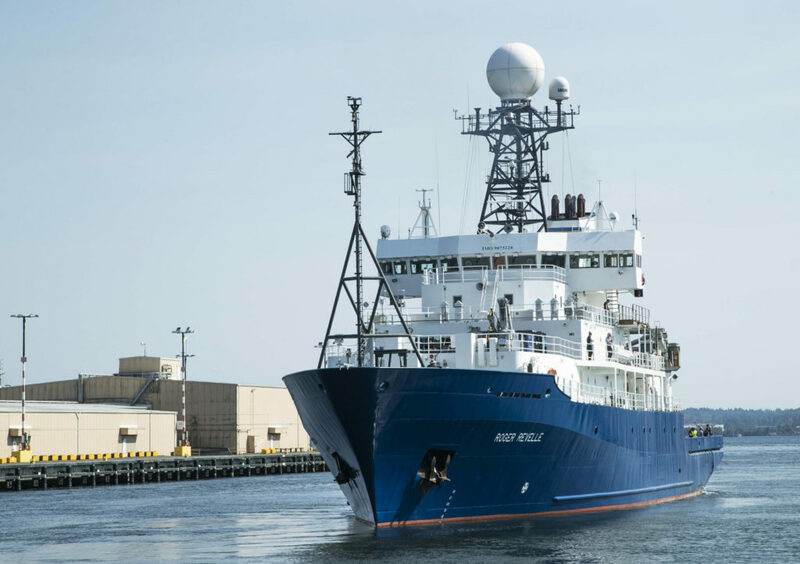 Using ocean optical sensors, microscopes and molecular tools (rather than telescopes), scientists on board the Research Vessel Roger Revelle have been examining microbial life hundreds to thousands of meters below the ocean’s surface. The microbes that make up the “constellations” represent the some of the Earth’s most abundant organisms: marine bacterioplankton. There are several hundred thousand to one million bacteria in every drop (one milliliter) of ocean water. When scaled to the total volume of the ocean (i.e. ~ 1.5 billion km3), there are approximately 120,000,000,000,000,000,000,000,000,000 (1.2 x 1029) bacterioplankton cells in the global ocean, or ~ 95% of the all the living biomass in the sea. In other words, the total marine bacterioplankton biomass is greater than all of the ocean’s zooplankton, shellfish, fish and whales summed together. 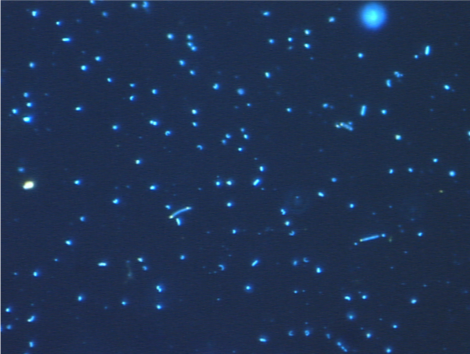 The majority of this unseen marine bacterioplankton grow very fast, dividing every couple of days. To meet their metabolic demands, bacterioplankton must consume vast amounts of organic compounds like carbohydrates and proteins and recycle inorganic nutrients like carbon dioxide, nitrate and phosphate every day. Though each of these microbes live on the timescales of days and work on spatial scales of nanometers (a billionth of a meter), their sheer numbers and high growth rates mean they affect ocean chemistry on the scales of ecosystems. These marine microbes are the true drivers of large scale biogeochemical cycles in oceanic systems as we are witnessing in the subarctic Pacific Ocean. With EXPORTS, we are examining the intricate mechanisms of the oceanic biological “carbon pump”. The carbon pump describes how photosynthically fixed carbon (usually from atmospheric carbon dioxide that has dissolved in the ocean) is processed and reprocessed through the ocean’s planktonic food web in the surface layers of the ocean. Ultimately a portion of the carbon is exported out of the suface by sinking and mixing to the deep ocean hundreds to thousands of meters below. How exactly the ocean absorbs and retains carbon largely depends in part on the growth of microbes but also where in the water column (between the ocean surface and abyss) they intercept and consume sinking organic particles or dissolved organic matter. For carbon, and other associated elements, to be stored for long periods of time in the ocean, it first must travese the portion of the ocean’s water column that extends between ~one hundred and one thousand meter depths. This zone is referred to by oceanographers as the ocean’s twilight zone. The twilight zone is so named not only because there is little to no light but also because the chemical budgets and biological processes that occur in this zone are not well understood. If microbes recycle the organic matter too close to the surface, the carbon escapes long-term storage. But if the sinking or mixed organic matter gets deep enough, then that carbon is removed from interaction with the atmosphere for decades to millennia. 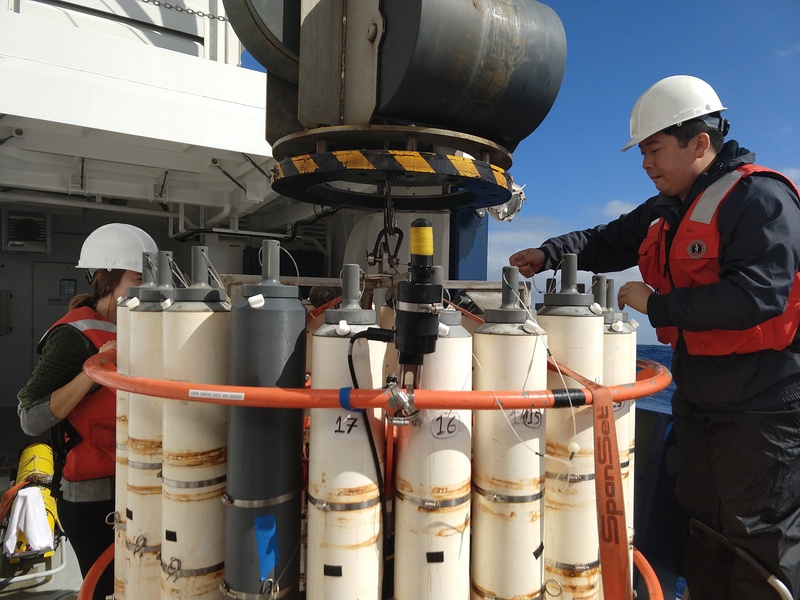 Our project is designed to investigate marine microbes and their interaction with organic compounds throughout the water column of the subarctic Pacific Ocean. 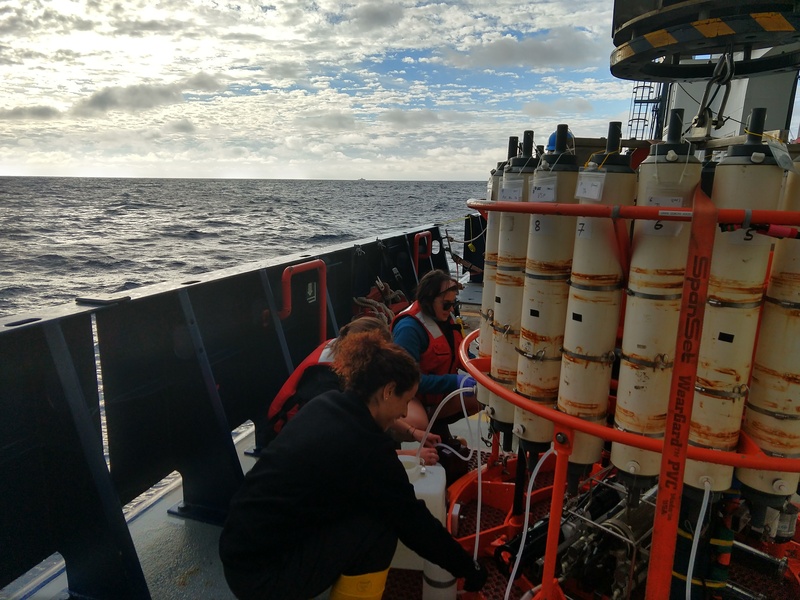 We are conducting experiments at sea that combine tools from ecology, molecular biology, and marine chemistry to investigate how bacterioplankton consume the organic substrates available to them. By examining microbial behavior, we will learn more about how the ocean’s “inner space” functions and how biology helps govern the movement of carbon within Earth’s systems. 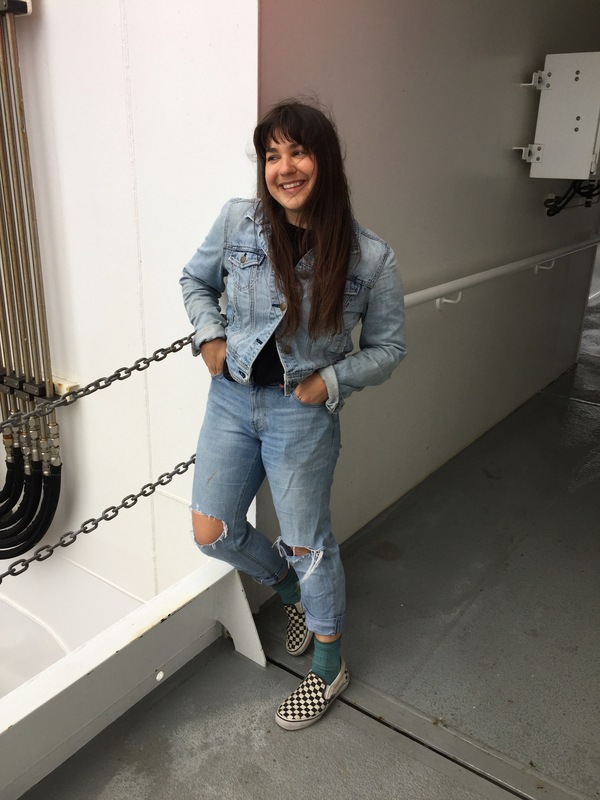 Sasha Kramer is a PhD student in marine science at the University of California, Santa Barbara, and is currently working aboard the R/V Sally Ride for the EXPORTS field campaign. I’m the type of person who likes to celebrate the little things. For instance, last week was my half birthday, and you’d better believe I celebrated with some peanut butter and M&M toast for breakfast (thanks Mark and John for stocking the galley with M&Ms!!!). I even did my best to pick out mostly blue M&Ms for an extra special treat. (Eeveryone knows blue M&Ms are the best color, right? This must be a scientific fact). 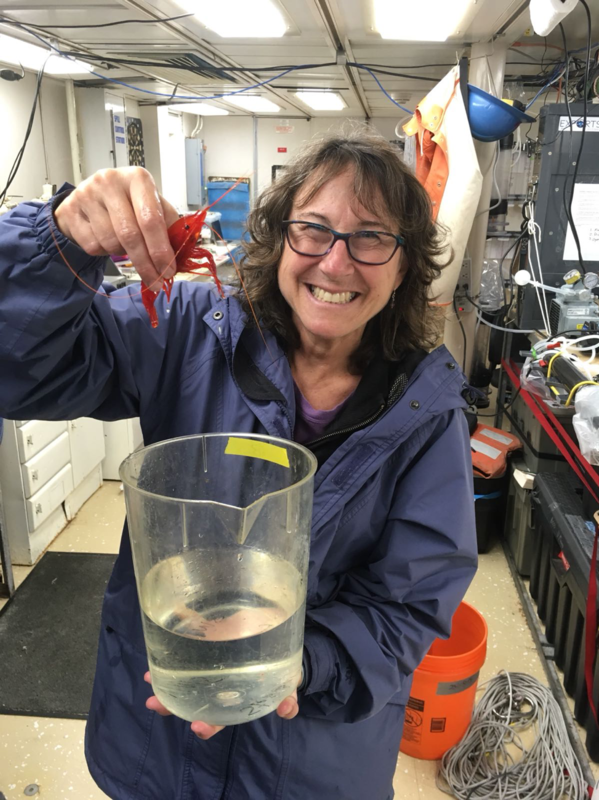 You might think there are few things to celebrate aboard a research vessel, but I would say that there are abundant opportunities for celebration with the right creative approach. The first cast of our CTD water sampler? The first sighting of the Revelle from the back deck of the Ride? The first successful float deployment? The rare rainbow stretching over the gray North Pacific? The one-hundredth nutrient sample? The one-thousandth nutrient sample?? These are all chances to break out a frozen peppermint patty and party on. As anyone who has been on a research cruise can tell you, keeping morale up can be a tricky thing. Inevitably, things will go wrong, you will be short on sleep, and you will hit the point of feeling cranky or tired or frustrated or all three at once. Given my propensity for celebration, it is maybe unsurprising that my lab mate (and officemate back at UCSB and now bunkmate on the ship) Kelsey Bisson and I not only represent the Hydro Team on the Sally Ride, we are also the self-appointed official/unofficial morale boosters aboard. We may be filtering 120-plus liters of seawater every day, but we make sure to take breaks to enjoy the little things in life…breakfast on the back deck with a view of the stormy ocean, walkie talkie calls over to the Revelle (hi Nils and Brian! ), and lots of chocolate covered almonds. So how do we plan to boost morale for the rest of the team during these 35 days at sea, you might ask? We have a few things in mind, including those frozen peppermint patties we keep in our lab van on the back deck (and Reese’s peanut butter cups and dark chocolate Hershey’s kisses… as you might imagine, a lot of feeling happy on an otherwise tough day has to do with the availability of good candy). You can find us throwing an impromptu boat-wide rave in our lab van, with the red lights turned on and the glo-sticks we packed from home cracked and glowing. Maybe you’ll spot us sampling from the CTD with our portable (waterproof!) speaker blasting. Whether it’s Paul Simon or Usher, music is also a big part of keeping morale high. 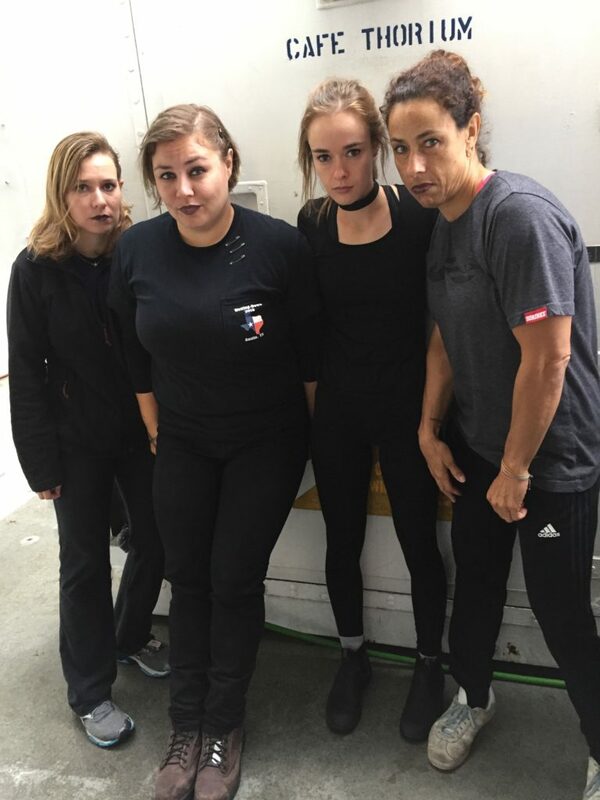 For this particular activity, it’s important to read the mood of the CTD cast. 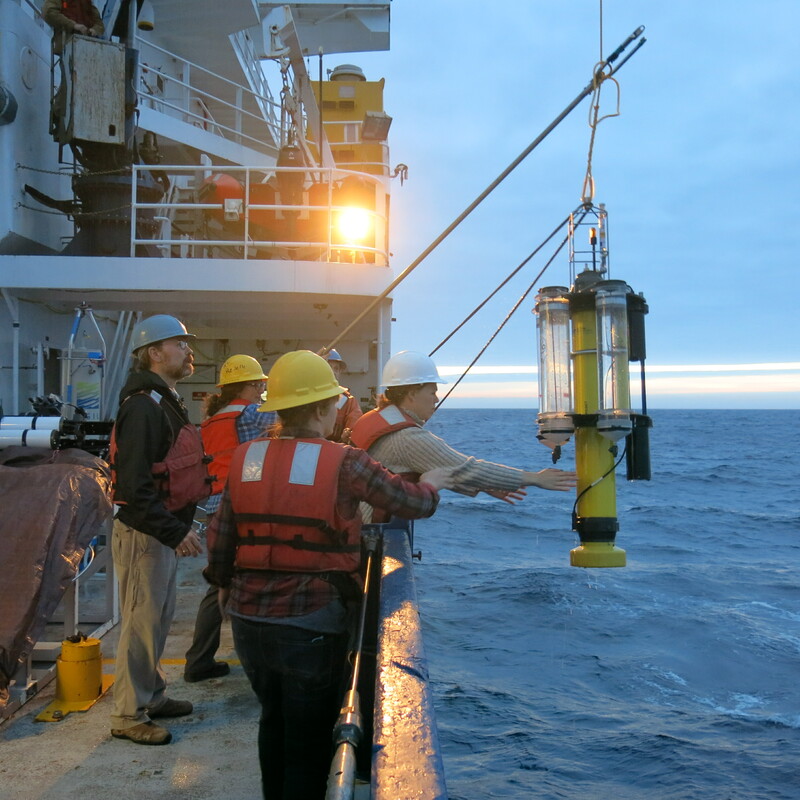 CTD stands for Conductivity, Temperature, and Depth which is measured with each water sample collected. Morning optics casts lend themselves well to calmer songs and gentle singalongs (think Vance Joy); evening calibration casts are more of a scene, with bumping bass and wild dance moves (while carefully sampling, of course). We’ve also instated Sally Ride Saturdays. We have five Saturdays together as a group, and each one represents an opportunity to have some fun together at sea. Our first Sally Ride Saturday, as we cruised through Canadian waters, was Canada Day (complete with denim on denim; see Kelsey for reference). Goth Day fell on our bad weather Saturday: black eyeliner and lipstick and nail polish (and Avril Lavigne) ensued, demonstrated excellently by some of the ladies from Team Thorium. 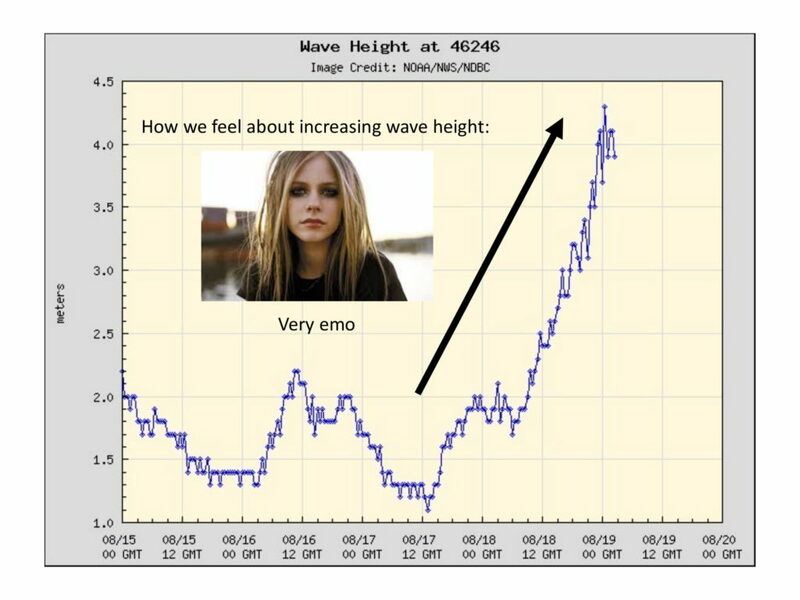 When the wave height increases this drastically, you can’t help but feel a little emo!! 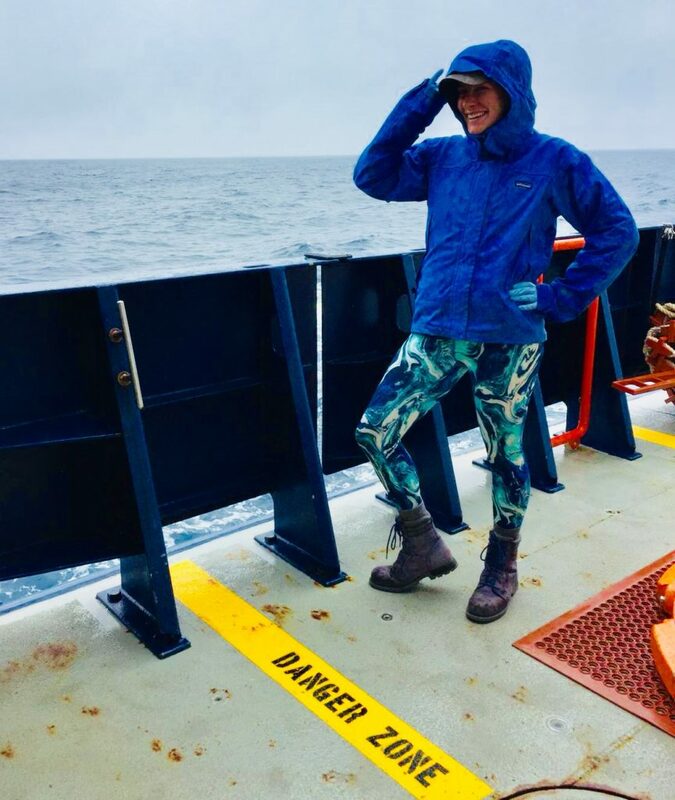 Our friends aboard the Sally Ride with us can look forward to upcoming Crazy Hair Day and Technicolor Day—it’s impossible not to crack a smile at various kooky hairstyles or feel your mood brighten at the sight of someone’s electric yellow foul weather gear! 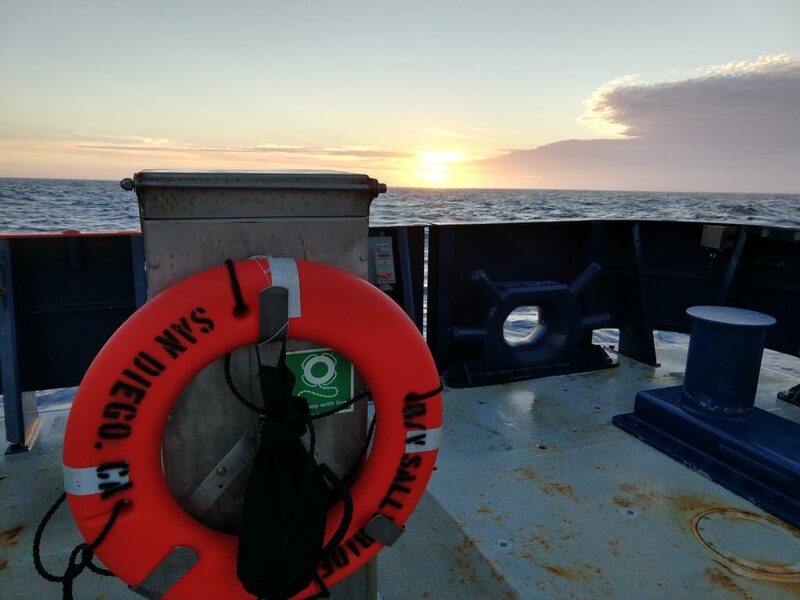 While research cruises can be challenging and tiring at times, we’re also really lucky to be out in the North Pacific together. Sally Ride Saturdays are a way to keep our spirits up when the days feel long and we haven’t seen the sun in 48+ hours (it’s pretty cloudy up here at Station P). We’re all focused on our science, but we are also part of a floating family for five full weeks. A healthy dose of (M&Ms and) fun is all part of the experience. And our friends on land are certainly not restricted from celebrating Sally Ride Saturdays too—in fact, we encourage it! Crank up the ABBA and break out the feather boas! It’s Mamma Mia Day next Saturday! You know we’ll be doing the same around the CTD. 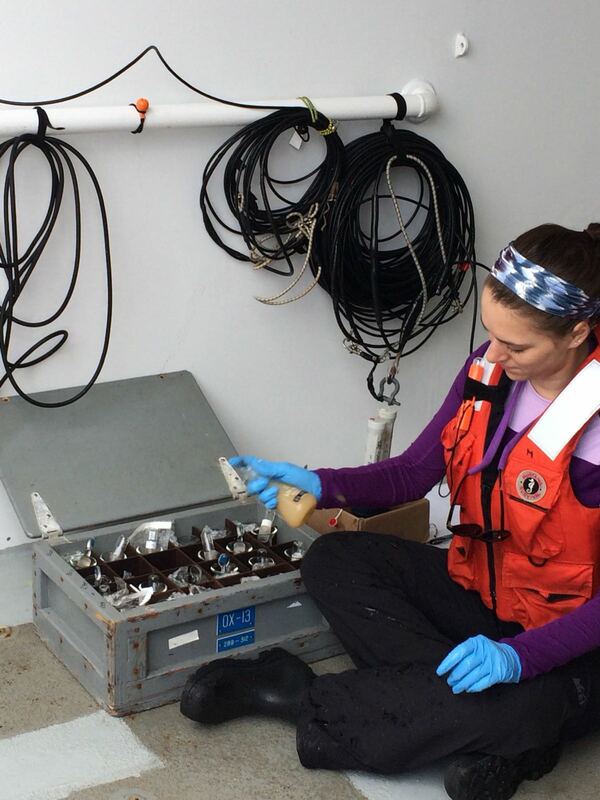 Abigale Wyatt is a PhD student at Princeton currently working on the R/V Sally Ride for EXPORTS. 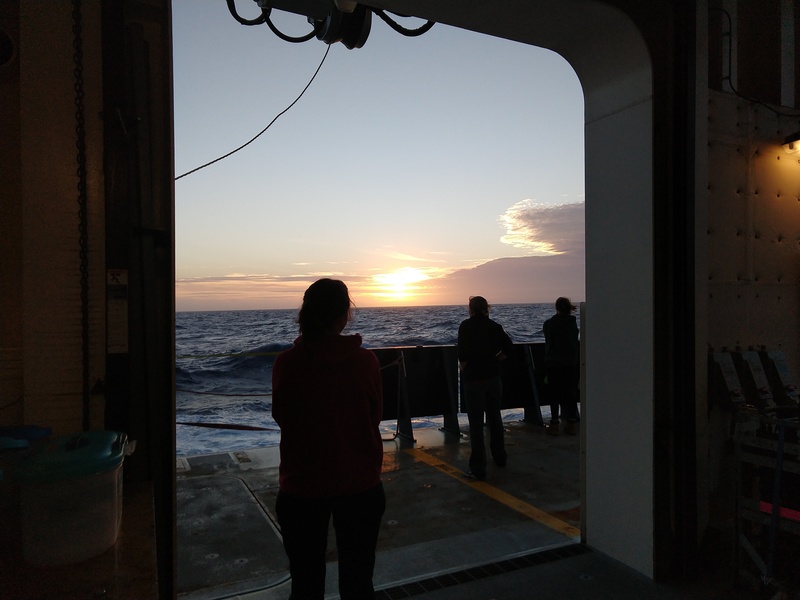 It’s been a little more than two weeks since we first set sail on the R/V Sally Ride for a month-long cruise to study how plankton in the ocean affect the carbon cycle and, ultimately, the climate. We left Seattle at the perfect time to get sunset photos of the city and surrounding hills. Most days, I still can’t believe I’m here. I’m one of the more junior scientists aboard. I haven’t yet begun classes for a PhD program at Princeton’s geoscience department, and having graduated two years ago with a degree in math (not chemistry, biology, geology, or anything ocean-related), in many ways I’ve felt totally overwhelmed. But having just finished eight years in the US Navy without ever deploying on a ship, I am so excited to finally be at sea that I haven’t been shy about trying to jump in and learn everything. 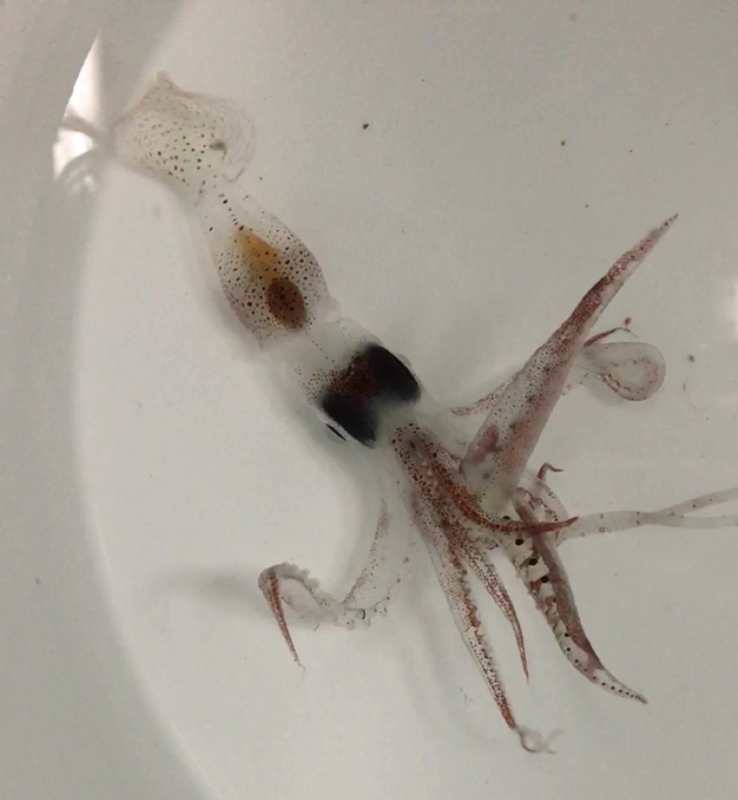 Fortunately, the first few days were spent transiting, which meant I had little science to do and plenty of time to find my sea legs while learning methods associated with our collections at sea. Sometimes it’s like learning another language: CTD, thorium, pipette, RISO, potassium permanganate, acidify, and niskin, for example. It’s a combination of chemistry terms that sound familiar, technical equipment I’ve never heard of, and science-y-words I thought I understood but have never used in any real context. Coupled with that was the task of trying to develop a casual understanding of the logistics of a complex sampling grid that would be used to get samples for more than 40 scientists, some of whom are the biggest names in the field. Like I said, somewhat overwhelming. So naturally, I’ve sought out one of my go-to means of comfort: looking up at the night sky. As a major astronomy nerd, I was incredibly excited when I realized our trip would coincide with the annual Perseid meteor shower. I envisioned lying out on the deck after a hard day of science, being lulled by the calming rhythm of the sea while staring at the deep, dark sky, watching meteors streak through my favorite constellations. It was a beautiful mental picture. Reality was not quite what I had imagined. 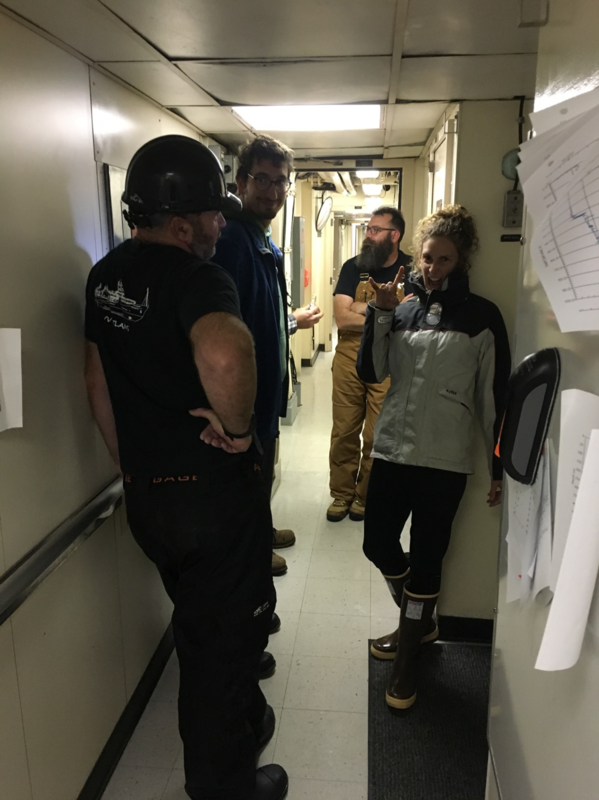 One few night, I went out on deck with a scientist from Woods Hole Oceanographic Institution who is working in my group. As we headed out, I chattered on about what planets were out, how great the Milky Way would look, and which direction we should face to catch the most meteors. In hindsight, I probably should have been more concerned with practical considerations: How wet will the deck be? What’s the cloud cover? What time do we have to work in the morning? Turns out, boats are wet. Wet and cold. And since we were still moving toward our station, water was sloshing and spraying, with the boat rocking as we steamed ahead. I felt silly for imagining I would lie out and relax on the deck all night. Instead, we stood, necks craning, waves crashing, looking at as much sky as we could see through the clouds. Apparently, the Gulf of Alaska is a pretty cloudy place this time of year, so we were lucky to have even 50 percent visibility. Scorpio was missing its legs and Cassiopeia was totally hidden, but at least Jupiter was big and bright. I pointed out the Northern Cross when we saw it! Our first meteor was super bright, probably one of the brightest I’ve ever seen. It was so fast we both gasped and pointed, then laughed at how excited we were. We saw more, including one with a tail so long it covered a quarter of the sky. While I’ve stargazed a lot since I was a kid, this was such a new experience. Seeing from horizon to horizon made it so much more apparent that we were sitting on top of a single round planet in the middle of this massive universe, tucked away in our quiet galaxy among stars and planets lightyears away. Since then, clouds have obscured the night skies too much to try again, but the ship is quickly becoming a second home. 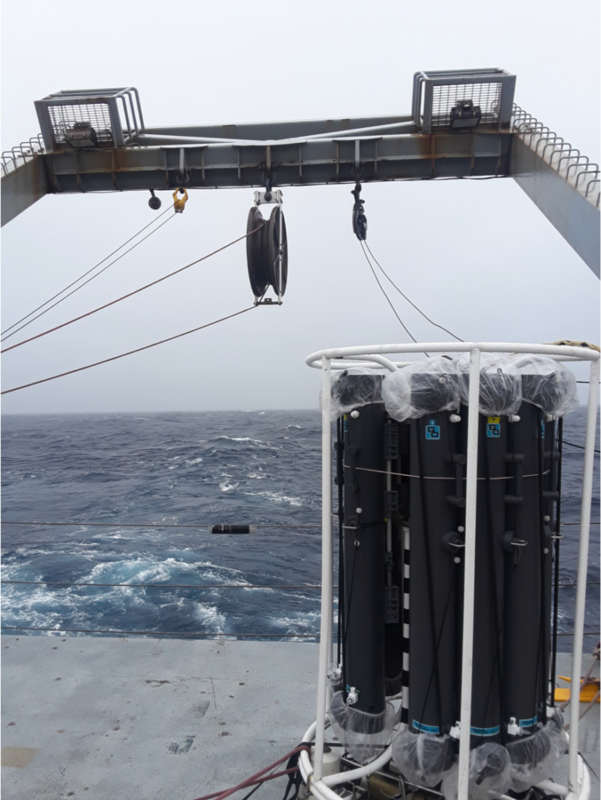 Several times a day we send out a Conductivity, Temperature, and Depth (CTD) instrument, which is a water-analyzing device equipped with niskin bottles that fill up at depth. In the lab we do some chemistry, including acidifying our samples by decreasing their pH, followed by adding potassium permanganate to allow the water to release particulates. Finally, we count the thorium radiation from our filtered samples using a RISO machine, all so we can tell how carbon is cycled by the ocean. It’s been a lot to learn and, still, everyday there’s more. The moments I feel overwhelmed, I just remind myself I’m lucky to be part of this huge project. Our research will help us better understand our oceans, our climate, and our planet. And while I may be a novice in ocean science, being at the very beginning of my graduate studies, this has certainly been a most stellar way to start! Kelsey Bisson is a PhD candidate working with Dave Siegel at UCSB and is graduating this December. Her dissertation seeks to understand carbon flux in the ocean through data syntheses of satellite and field data around the world. She is currently working aboard the R/V Sally Ride for the EXPORTS field campaign. Let me now say this: Step aside Jimmy Choo; steel-toed boots are having their moment. Indeed, “Every day is a fashion show and the world is the runway,” according to Coco Chanel. The same can be said for life on the R/V Sally Ride, as I’ll try to demonstrate. Since I hopped aboard to join the hydro team (with Sasha Kramer, my fellow lab mate also working with David Siegel at UCSB), I’ve noticed there’s no shortage of runways on the Ride, from the hallways leading to the main lab, to the starboard side sampling deck, to her majestic bow with infinite views of blue. Those participating in this field campaign have been rocking this summer’s hottest treads and threads (hottest as in pushing 65 degrees Fahrenheit on a good day), and we expect these trends to hit the continent any week now. Of course, living on a ship for five weeks with hazardous working conditions and tiny closets means that comfort and consistency here is key. But don’t confuse those two C’s with “boring.” Nay, when these sub-arctic silver seas aren’t stealing the show, Dr. Claudia Benitez Nelson’s yellow boots most definitely are. They’re not just any yellow; they’re the bright, waxy color not unlike that of French’s yellow mustard. We’re left wondering, did the inspiration from this look come from an anticipation of the galley’s carefully curated condiments, OR is this a nod to Marc Jacob’s summer collection showing plastic yellow pieces as a comment on the dissonance between solar power and our longtime reliance on human-made materials? We may never know, but that’s the fun of fashion. She keeps the rest of her look simple, expertly showcasing how bright boots become the exclamation point of an outfit. “Amazon.com,” she says, when I ask where she got these punchy power pedestals. Research scientists have been accused of being myopic at times, and that could be because we’re obsessed with microbes & their biogeochemical adventures far beyond that of the average Jack and Jill. Naturally, color us guilty as charged, but we also love the big picture. Perhaps nowhere is this more apparent than in the impossibly chic monochromatic getups of Drs. Collin Roesler and Xiaodong Zhang. Xiaodong Zhang’s all-grey getup can only be described as simply celestial, boldly celebrating the fact that we haven’t seen the Sun for days. No, you will not find Louis Vuitton here on R/V Sally Ride. 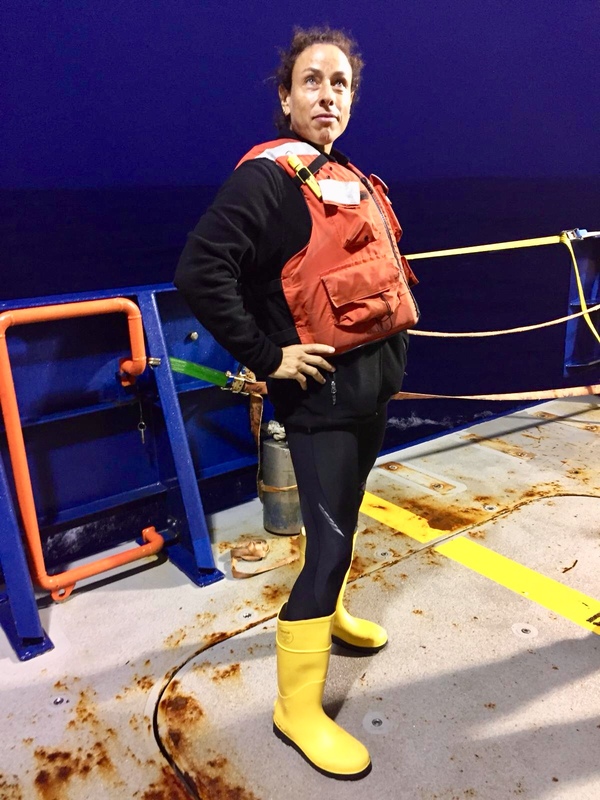 Nor will you find Dr. Jason Graff, a first round draft pick for chief scientist on R/V Roger Revelle, and a narrowly close second to Louis in his personal sense of style. 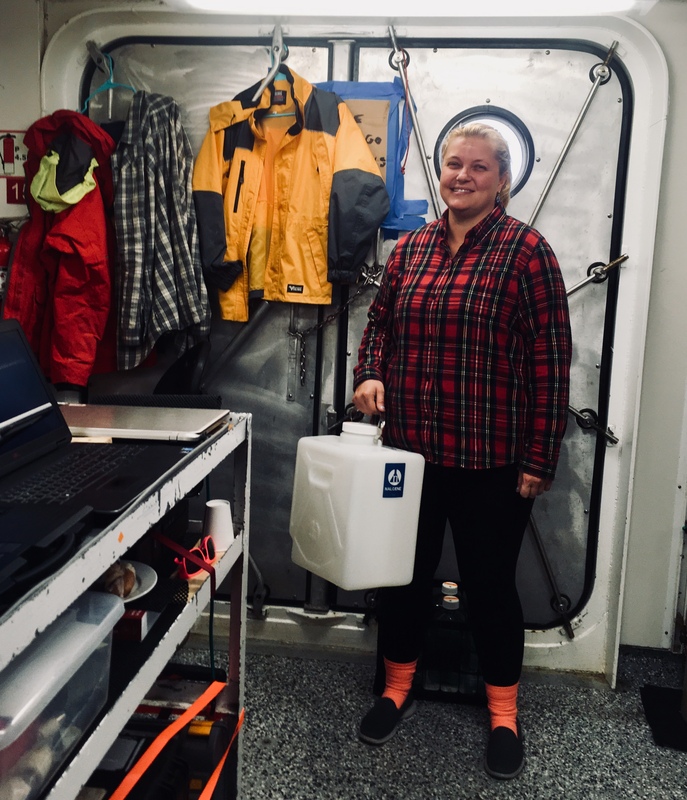 But you will find Taylor Crockford and her fierce flannels as she hauls hundreds of liters of seawater throughout our labs every day. And my lab mate Sasha Kramer sporting some sensational stitches you’d half expect were designed by Donatella Versace herself. “My mom got me these for my birthday,” she says. Through 20-foot seas, instrument mishaps, whipping winds, fake fire alarms, fake abandon ship alarms, diesel miasmas, and all too real sleep deprivation, I look around at all the hardworking happy fashionistas around me. I can’t help but wonder: Was Tim Gunn thinking of us when he muttered his words to live by, “Make it work”?